We are pleased to introduce Issue 4 of the Journal of Interactive Technology and Pedagogy. To say that this issue features five articles from a variety of disciplines would understate the quantity of material gathered here and oversimplify the range of approaches these authors have taken in presenting their work. Our contributors share the messy, exciting process of experimentation in pieces that range from traditional essays to blog-style reflections to expansive, multi-authored projects branching out from the node of this journal. Since its inception, JITP has sought to showcase scholarship that operates outside the traditional essay format, and our editorial collective has struggled to find language that invites innovation, while still providing clear expectations to guide our contributors. We have debated at length how to word our call in a way that does not privilege papers; we have (until recently) resisted specifying a word count in our submission guidelines because we were wary of inadvertently discouraging non-textual submissions; we continue to question how we can push the boundaries of the peer review process without unduly frustrating authors and readers. As Luke Waltzer, co-editor of Issue 3, recently told Inside Higher Ed, “It’s tough.” Although the contents of Issue 4 are primarily text-based, we are excited to offer a range of scholarship that expands our understanding of what academic “articles” can be. In putting together this issue, we discovered that challenging traditional notions of academic publishing often means blurring the line between student and expert. Two of the projects featured here are the work of student groups guided by faculty. A third is the work of a professor reflecting on a student-directed project, while a fourth calls on professors to be as adaptable in teaching research as they are in practicing research. An essay on how we might use interactive technology to ease the transition from student to professional rounds out the issue. “BeardStair: A Digital Humanities History” documents how a group of undergraduate and graduate students employed this kind of resourcefulness in researching the history of a mysterious trove of illustrated books left in the book-return bin at the San Jose State University campus library. David Coad, Jonathan Cook, and Kelly Curtis guide us through a research process that began in 2011 and culminated in a scholarly digital edition. They chart assignments, responses, and discoveries along a timeline that incorporates work and critical reflection from numerous collaborators. Their interactive history models how similar projects might engage both textual history and digital possibility. In “Online Discussion Boards as Identity Workspaces: Building Professional Identities in Online Writing Classes,” Patricia Boyd argues that online discussion boards – which have long been used as supplements to in-class discussions – might be repurposed as spaces for students to develop and reflect on professional identities. Through a series of guided interactions with their peers, students test out new identities and practice being experts. Whereas Boyd’s students use interactive technology to engage each other as experts, Nancy Ross’ students use data visualizations to question the expertise of art history texts. “Teaching Twentieth Century Art History with Gender and Data Visualizations” tells the story of how a student-designed data visualization project revealed gender bias even in exhibits that had been praised for including female artists. By devising and implementing their own digital research strategies, Ross’ students effectively critiqued secondary sources, turned a critical eye to received knowledge in a conservative community, and learned to trust their own abilities as budding experts. The final project featured in this issue is the culmination of a long collaboration between Roger Whitson and JITP. Like the other contributors to this issue, Whitson sought to create a learning environment that did not just prepare students for the outside world, but actively engaged it. He approached JITP to ask if any members of our editorial collective would be willing to work with his fall 2012 English class on a digital publishing project, and Kimon Keramidas and Amanda Licastro responded enthusiastically. The materials collected here document how Whitson’s students created multimodal content responding to nineteenth century novels, then worked with Keramidas and Licastro to edit and produce a class journal fit for online academic publication. We are proud to present this journal to the public, and we are honored to have been involved the journal’s creation. Reflections on the process from Whitson, Keramidas, and Licastro are included in this “article,” and serve as the “Behind the Seams” section for Issue 4. The emergent theme of student expertise in this issue is particularly fitting, given JITP’s ongoing commitment to equal representation of students and faculty or staff members in our editorial collective. We have struggled to maintain this balance as we struggle with its implications. Does our insistence on maintaining an even split provide students with professional opportunities or artificially reinforce the distinction between students and experts? Are we inadvertently privileging the traditional academic path from doctoral student to professor and ignoring other possibilities: the students who are also staff, the Ph.D.s who educate outside the classroom, the educators who never sought a Ph.D.? And as those of us who were studying for Orals when the journal first launched now approach the dissertation defense, what happens when we pass through the ephemeral state of “student” to the other side? We look forward to addressing these and other tough questions as our journal continues to grow. Onward to Issue 5! Leila Walker is a Ph.D. candidate in English at the CUNY Graduate Center, where she expects to defend her dissertation–“Touching Time: Forms of Romantic Temporality”–in March 2014. Stephen Klein is the Digital Services Librarian at the CUNY Graduate Center, where he assists and supports students and faculty access, extract, use, massage, and present (digital) information. Instructors teaching research methods, especially undergraduate writing courses that focus on researched arguments, should use various web-based interactive applications, usually referred to as Web 2.0 technologies, throughout the research process. Using these technologies helps students learn various 21st Century technology and media literacies as well as promote diverse student learning methods and active learning pedagogies. The article provides examples of different type of web-based applications that might be used throughout the research process and then ends with a discussion of logistical concerns like student access and privacy rights. What? Are you crazy! I can’t trust those sites. I shout out to Facebook or Twitter. I don’t ask this question of my students; instead, I ask this question of my colleagues when I do workshops about teaching with technology (especially when teaching big end-of-semester term or research papers). Can you guess the results? If we admit that we are just as “guilty” of using Google or referring to Wikipedia and other online “friends” when seeking out information, isn’t it time we accept these as legitimate steps for research in the 21st century. Therefore, if going to the web is the one of the first steps for research, we should “digg” using various web applications when teaching research skills. Digg is the catchy title for thinking about using web applications in research. On the one hand, I believe instructors do not use social bookmarking tools, like Digg, nearly enough while teaching basic research skills, especially in First Year Composition courses. However, I do not use Digg, nor ask my students to use Digg, because it has been repeatedly critiqued for the gender, age, and socioeconomic bias of the users who curate the materials (Lo 2006; Solis 2009; Weinberg 2006). Digg’s biased user population is representative of the promise and peril of the internet in general. If anyone can post on Digg, and I choose to use such a web application in my research, how does the bias of the application impact my research process and product. However, is that not the case with almost any research process and product we suggest for our students? In short, part of what we are teaching our students about research is to just be plain critical, of everything, including the tools we use (Selfe 1999). Critical engagement with the technologies they use is a powerful motivator for having students work with various web applications. Learning how to use different technologies, learn new technologies and critically engage with technologies prepares students for staying successfully employed in the 21st century. The majority of lists citing the key skills needed to succeed in the 21st century include “information literacy” as well as “consume and compose multimedia.”(AT&T 2010; CWPA 2008; Partnership for 21st Century Skills n.d; NCTE 2008; Kamenetz 2010). If the Web 2.0 world is promoting these types of changes, researching in the Web 2.0 world might need to be considered a new literacy. This article argues that instructors teaching research methods, especially undergraduate writing courses that focus on researched arguments, should use various web-based interactive applications. The article discusses how these applications, usually referred to as Web 2.0 technologies, are a way to meet 21st Century Literacies learning objectives as well as diversify student learning methods and facilitate active learning pedagogies. The article then provides examples of different types of web-based applications that might be used throughout the research process, and ends with a discussion of logistical concerns like student access and privacy rights. Once you get out into the real world you won’t have your textbooks with you, so having experience using IT as a learning tool helps prepare people for life after textbooks. The obvious first reason for teaching students to use web applications in research is “if you can’t beat them, join them.” I know students are going to use Google; therefore, I embrace that default and enjoy introducing them to specialized Google search engines like Google Scholar (Google’s search engine that focuses on returning results from scholarly books and journals), Google Books (Google’s search engine that returns results from Google’s book scanning project), and Google News (Google’s search engine that returns results from news outlets as far back as the 19th century). I enjoy their “shock” in learning about these specialized search engines. Since 2004, college students responding to the annual ECAR Study of Undergraduate Students and Information Technology have rated themselves highly for the ability to “use the Internet effectively and efficiently search for information” (Smith and Caruso 2010, 66). Specifically in 2010, 80.7% gave themselves “high marks (expert or very skilled)” and over 56% gave themselves high marks for “evaluating reliability and credibility” (69). However, if students are as information literate as they think, then why does it feel like there is a “crisis” of 21st Century Literacies? Although it feels like the “crisis” of 21st Century Literacies is restricted to the 21st century, the heart of this crisis is wrapped up in various techno-literacies and the various media or techno-literacy crises have been rampant for over 40 years. Since the National Council of Teacher’s of English (NCTE) published the “Resolution on Media Literacy” in 1970, it has followed up with a variety of other related lists and position statements about techno-, media, and 21st century literacies. describe, explain, and persuade with technology (Conference on College Composition and Communication 2004; CWPA 2008; Intel n.d.; NCTE 2005; NCTE 2008; & Partnership for 21st Century Skills n.d.). Forbes’s top 10 list of “skills that will get you hired in 2013” listed “computers and electronics” as number five; the top two skills listed were “critical thinking” and “complex problem solving” (Casserly 2012)—both required of major research and writing projects. Teaching research processes through and with web 2.0 technologies combines these skills. In a study of basic writing students, Vance (2012) found that although students do want the interactivity that comes with Web 2.0 technologies, they also want more stable, instructor vetted and delivered content as well. This desire hints at the fact students do want and need help identifying and using digital information. Instructors are being hailed by both (the overestimation of) their students as well as (the underestimation of) their colleagues to help students become better technologically-mediated researchers and communicators. Getting students to understand that there is more to Googling than just Google not only helps develop more critical digital research skills, it builds upon what they already know and do. Most individuals do some form of research every day, and more often than not, Google does get the job done. Starting with what the students already do works not only because we are going with the flow; actually, it is because it is going with their flow. Brain research demonstrates that students learn best when what they learn is connected to something they already know or do (Leamnson 1999; Zull 2002). The process of teaching research skills needs to be built upon students’ existing processes. Instead of trying to completely rewire students–as science instructors often attempt to do when they continually repeat that seasons are based on the position of the earth’s axis and not its proximity to the sun–help them adapt and expand their already hardwired “Google it” response. A number of scholars have published that various Web 2.0 applications support research-related activities like reading (Won Park 2013) and finding and evaluating information (Magnuson 2013), and are compatible with learning pedagogies such as constructivism (Paily 2013), connectivism (Del Moral, Cernea, and Villalusttre 2013), and problem-based learning (Tambouris et al. 2012). Increasingly, both scholarly as well as more plebian research resources are only available in digital formats, usually accessible through the web. Students not only need to learn how to (systematically) search for these resources, they need to learn to critically consume different types of resources, some with no written words. Once students find and read these resources, they also need help collecting, archiving, and analyzing them as well. Finally, with the variety of available digital publication media, students can contribute back by producing multimedia projects as they report out on their research process and product. What are You Digging With? For example, instructors may only think that YouTube (a video repository where individuals can make accounts and upload videos to share) is only good for finding questionable resources and presenting final projects in video form. However watching videos on YouTube, Vimeo, or TED might help students struggling to find a topic that interests them or see how people are currently talking about a specific topic. It is definitely time to rethink “YouTube is a bad resource” just because anyone can post a video; will anyone question the scholarly veracity of one of Michael Wesch’s digital anthropology videos? YouTube can also help solve common formatting problems as well. Instead of using time in class showing students how to do headers and hanging indents in their final research papers; assign as homework a YouTube video demonstrating how to do the formatting functions in different version of MS Word or OpenOffice. Ultimately the goal for this article is to outline examples of what types of web applications might be incorporated at various points within a traditional (primarily secondary) research process. First, getting students to produce and share texts through the research process helps them keep connected with an audience. Second, producing digitized final projects that are published to the web, especially multimedia projects, makes students’ work refrigerator door worthy; you know, like the finger paintings we brought home from preschool. And Facebook is the new refrigerator door, instantly giving students a real audience with real feedback that they care about. Getting students started on a research project is always more difficult than expected. At the beginning of a research project students generally need to identify a topic that is engaging to them as well as narrow it down to something unique. In both cases, students need help thinking differently about their interests. As Brooke (2009) suggests, researchers should understand search results as “departure points, that bring potentially distant topics and ideas in proximity both with each other and the user” (83). Sometimes it just helps to provide them with a variety of alternative search engines (anything besides the general Google search engine) and media repositories (image, audio, video, and text) to help identify what interests them. Many students do not pay attention to the variety of ways they may filter search results in the left hand menu of a Google search results page nor know that Google has specialized search engines like Scholar, Books, and News. Although the web is full of personal rants and raves, those non-scholarly resources, like personal blogs and wikis (including Wikipedia), can be extremely useful in helping students further narrow a topic to something manageable and with a unique angle as well as analyze what they already know or believe about the topic. Using search engines that present the search results visually (for example: Cluuz, Hashtagify, Search-Cube, or TouchGraph) can also help with narrowing a topic as well as preparing a list of future search terms (figure 1). Figure 1: Results from a Cluuz search; multiple visual cluster maps presented on the right side of the page. In short, the varied web resources provide students the opportunities to both explore as well as narrow their research topics. Introducing students to advanced search pages or results filters will not only help them identity interesting, focused research topics, it will help them find relevant secondary resources as well. Teaching students to find resources is generally easier than helping students collect the resources they find. Based on my experience, robust citation management applications like Zotero, Mendeley, or EndNote have a steep learning curve for users to understand both the citation management as well as note taking functionalities. The time to learn the various aspects of the applications usually requires more time than available in freshman and sophomore level classes with major research projects. Instead of using these more complex applications, students can use social bookmarking sites, like Delicious and Diigo (usually easier to learn than full resource collecting programs), to keep track of their resources. Social bookmarking sites collect users saved webpage URLs. Except, instead of being restricted to one computer, like when saved using My Favorites in the Internet Explorer browser, social bookmarking sites save the list of links to a server the user can access from any computer connected to the web. Most social bookmarking sites also allow the user to associate notes with each bookmarked webpage. 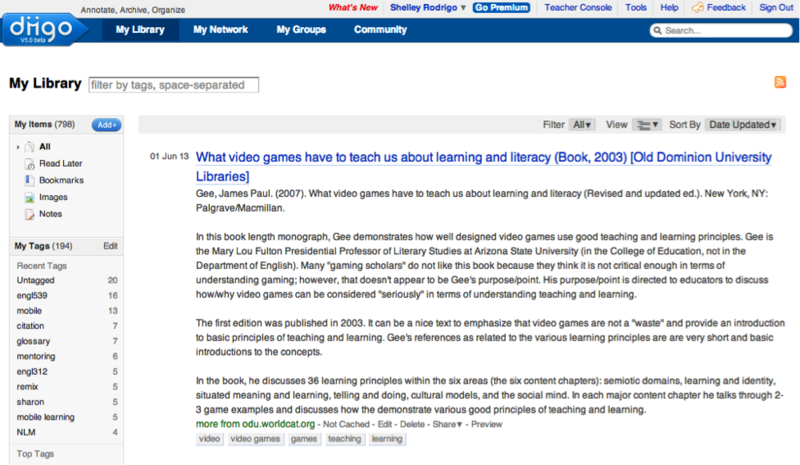 Even if students are collecting books they found at the library or journal articles they found in a library database (resources that are not normally associated with a webpage), they can bookmark WorldCat’s or the library’s webpage representing the book (figure 2) and link to the permalink, or deeplink, into a library database resource. Johnson (2009) explicitly argues that using different Web 2.0 technologies, like blogs and social bookmarking, allow students to more readily collect both their secondary as well as primary resources. The amount of detail included with the bookmarked resource is only limited to the assignment requirements given to a student. An instructor can ask a student to include information like a bibliographic citation, summary, and source evaluation in the “notes” area of the social bookmark for each resource (figure 2). Figure 2: An example of a robust annotated bibliography entry in the social bookmarking application Diigo. Since they are social, social bookmarking sites are by default public and make it easy for students to share resources with one another, or their instructors. 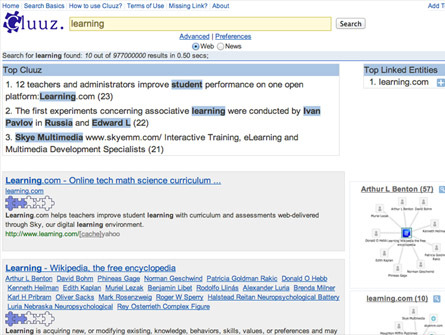 Social bookmarking sites will also help students find more resources. They can find individuals who have bookmarked the same resources and identify other resources. Students can also identify how individuals tagged resources with identifying keywords, like indexing, and use those tags as alternative key words in more searches in databases and other locations. As web-based applications, social bookmarking sites also address some access issues; students who do not have regular access to the same computer can still store all of their collected resources in one online repository that they can get to from any computer with an Internet connection. More sophisticated social bookmarking tools like Diigo also allow students to read and annotate web resources (applications like A.nnotate and Internote also allow web page annotations). 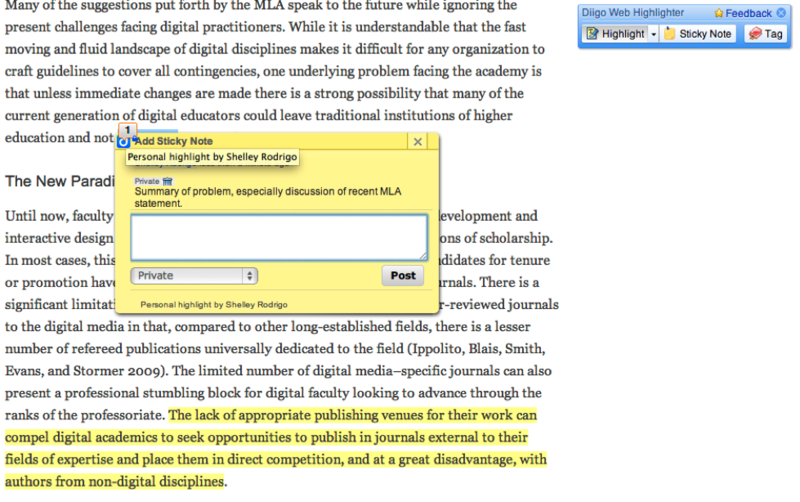 Diigo allows users to highlight and leave post-it styles notes on most webpages (figure 3). Figure 3: Example of Diigo highlight and “post-it” note style annotation tools. Having the ability to take notes does not inherently prompt students to be critical readers, instead a functionality that enables commenting might prompt students to ask what type of questions and comments should the annotated on their resources. English faculty, or librarians, can provide students with a list of resource evaluation questions that students might then answer by highlighting and taking notes on the page. Since Diigo is a web application, students can share their annotated resource with other students or the instructor. Once students’ notes are digital, it is easy for them to slide them around, looking for connections to help synthesize ideas and resources. Again, these web applications do not inherently make students engage their resource materials in more sophisticated ways; instead, these resources provide students with the opportunity to engage with and connect their resources differently. Writing instructors have asked students to make mind or cluster maps of their research topic, resources, and ideas for decades; however, having students make these in a web application allows for more detailed information associated with each node. Many of the digital mind map applications (like Mindomo and Popplet) allow users to include text, images, videos, even attachments to each individual node of information. Many mind map applications also allow users to collaborate, sometime even synchronously, within the same document. A team of students working on a research project could collaboratively construct a mind map with the different resources each individual located. Timeline and geographical mapping applications, web applications that allow users to map information as a point in time or geo-spatially, also allow students to interact with their resources and data in different ways (figure 4). Figure 4: Example of a timeline showing various organizational statements about 21st Century Literacies. Having students play with their resources and data forces them to spend time with their resources and data. Ultimately, it is that time with the data that helps students the most in synthesizing information in a meaningful way. Students should be drafting and getting feedback along the entire research process. One of the standard functions of various Web 2.0 applications, also regularly referred to as read/write web, is some form of interaction between the many kinds of readers and writers (Dilager 2010). Even as early in the process as identifying and narrowing a topic, students should be able to share their narrowed topic or research question and possibly make a research plan. In either case, students will want feedback about their work. Microblogs, like Twitter and the Facebook Status Update, give students the opportunity to gather quick feedback on material as small as a research question or thesis statement. There are a variety of read/write web applications students might use to report out and invite feedback of all amounts during their research projects. Blogs, wikis, and document sharing applications like Google Drive would allow students to document large portions of their research process and product. These popular applications are also probably the best known and most written about web applications to support the teaching of writing, especially as a way to expand audience feedback and participation with a given project (Alexander 2008; Johnson 2009; Nakamura 2011). Blogs, wikis and document sharing are usually structured to facilitate some form of a social network that invites “replies” to any posted work. Some advanced feedback applications allow readers to respond to specific sections of a draft. For example, the CommentPress Core plugin for a WordPress blog allows readers to comment on individual paragraphs as well as an entire posting. Similarly, VoiceThread allows viewers to comment on individual presentation slides as well as draw on an individual slide to reference a specific area of a visual. Not just text based web applications facilitate replies to content; even the more visual Web 2.0 applications where students might post parts of their research usually include spaces for readers to make comments. Most image and video repositories usually have reply features. Even if students are publishing their work in progress or request for feedback in different locations, using microblogs can help them to send out requests for feedback with links to where ever the material is residing. In short, there is no technological reason not to request and receive feedback throughout the entire research process. Many of the applications mentioned above might also be used as final presentation formats or media. Document sharing would allow for easy publishing of traditional paper style presentations. And if students were blogging their entire research process, they can post their final presentation as the last post (however, the first visible to visitors) on their research blogs. Students might use alternative visual presentations applications like Prezi to distinguish themselves from the masses that use PowerPoint. However, there are a many Web 2.0 applications not discussed in this article that would allow students to get really creative with their final product. With all the freely available web 2.0 applications mentioned in this article or listed at websites like Go2Web20 and Discovery’s Web 2.0 Tools, students could produce a variety of media including audio or video files, timelines or maps, digital collages or mind maps. Asking students to produce their final presentations in these alternative formats does not necessarily relieve them of the rhetorical responsibilities of a composition class (Takayoshi and Selfe 2007). Asking students to write cover memo identifying their purpose, audience, and other rhetorical factors as well as discussing how their project meets those rhetorical factors reengages students with their rhetorical responsibilities. Beyond thinking about how to use the technologies, many instructors have two major concerns about incorporating any technology into their assignments: access and support. Although these are both legitimate concerns, the digital divide is alive and well in the second decade of the 21st century (Jansen 2010), the need to creatively overcome these concerns meets the objective of making our students more technologically savvy. In other words, most individuals face some form of technological access and support issue on any digital project. Putting students into groups for assignments, even if they are just support and peer review groups for research projects, resolves a lot of access and support issues. Constructing student groups as collaborative learning communities empowers them to share knowledge and resources, including “access” to specific types of needed hardware and software and the skills to use it. Having students understand that finding and learning how to use a specific technological application is both another example of research as well as a skill they will need to continue to hone with how fast both hardware and software updates and evolves. If a given Web 2.0 application’s help page is not helpful, and the group can’t figure it out how to use the program, YouTube is always a good place to look for help with any “how-to” question. And if there is still no answer on YouTube, maybe it is time for instructors to make a few “how-to” videos and post them up to YouTube. Another concern that faculty, administrators, and scholars have about using web applications in classes is privacy, especially in relation to legal issues like the Family Educational Rights and Privacy Act, FERPA (Diaz 2010; Ellison and Wu 2008; Rodriguez 2011). Although many of the web applications I discuss above have privacy options, more conservative interpretations of FERPA argue that students rights are not protected since the school does not have an officially signed legal contract with the application provider. There is no one easy solution to the FERPA issue; however, honesty is the best policy. I have discussed using these types of applications with the legal personnel associated with my institution. With their help, I’ve added a section to my syllabus about using web applications (Appendix). In short, this section notifies students of their legal rights to privacy and legal responsibilities like copyright infringement; it also provides them an alternative option that is not posted to the Internet. Of course, the alternative option is the traditional research process and paper; however, to date, I have never had a student take the alternative option. I have had an increasing number, still a very small number, choose to password protect their work; however, no one has refused to use the web application. Long-term access and archiving are final concerns with using web applications for academic assignments. It is true that individuals or companies maintaining different web applications go out of business and can no longer support the website. For example, I once had a student construct a beautifully researched and documented timeline and then the company supporting the timeline application stop supporting the service. Similarly, I’ve had classes of students develop mind maps in mindmeister for free before mindmeister canceled their free accounts; those mind maps are now inaccessible (unless the student pays for them). Again, instead of using this as an excuse, it can be a “learning moment” to have discussions with students about archiving their work in an alternative format. At minimum, it is relatively easy to either take static or dynamic screen captures to save images or video of student work. Consider having students use free screen capture software, like Jing or Screencast-O-matic, to report out and reflect upon their work as a part of their assignment. The could make a five minute video, or two, that introduces the project, discusses their rhetorical choices, and reflects upon the process of constructing the text. This reflective screen capture video assignment does double-duty in archiving their work in an alternative format. Interestingly enough, many educational institutions or educational technology companies have tried to address issue like FERPA and archiving by developing their own versions of Web 2.0 applications, like Purdue University’s relatively successful Hotseat and Blackboard’s incorporation of blogs, wikis, and social media like interfaces into their learning management system software. However, I agree with Jenkins (2008) and Dilager (2010) that replicating services is generally not a good idea. Most homegrown technologies never work as well as the “original” and other institutional issues about continued command, control, and support emerge. Instead, Dilager argues for a “critical engagement with Web 2.0” (24), implying that both faculty and students should consider the original purpose and authors/companies producing the Web 2.0 applications they are using. For example, Facebook is a service for profile application (the service is free because the application mines profile information and sells it to other companies). Faculty should understand Facebook’s commercial element before requiring students to use the application. This type of critical engagement brings us full circle to the issue of user/curator bias in Digg, just as with evaluating research resources, faculty and students should evaluate the technologies they choose to use. Although there are a variety of reasons that might make it difficult to incorporate different interactive web-based, Web 2.0, applications into undergraduate research courses, the benefit of having more engaged students as well as more critical and complex researched projects is worth the work. Providing students with a scaffolded project that asks them to engage with these different technologies helps prepare them for the variety of research processes they will undertake in their future academic, professional, and civic lives. Alexander, Bryan. 2008. “Web 2.0 and Emergent Multiliteracies.” Theory Into Practice 47(2): 150-160. OCLC 424874670. ASCD. 2008. “21st Century Skills.” ASCD. Accessed September 5, 2013. http://www.ascd.org/research-a-topic/21st-century-skills-resources.aspx. Association of Colleges and Research Libraries. 2000. “Information Literacy Competency Standards for Higher Education.” Association of Colleges and Research Libraries. Accessed September 5, 2013. http://www.ala.org/acrl/standards/informationliteracycompetency. Brooke, Collin Gifford. 2009. Lingua Fracta: Toward a Rhetoric of New Media. Cresskill, NJ: Hampton Press. OCLC 366469179. Casserly, Meghan. 2012. “The 10 Skills That Will Get You Hired in 2013.” Forbes, December 10. http://www.forbes.com/sites/meghancasserly/2012/12/10/the-10-skills-that-will-get-you-a-job-in-2013/. Conference on College Composition and Communication. 2004. “CCCC Position Statement on Teaching, Learning, and Assessing Writing in Digital Environments.” National Council of Teachers of English. Accessed June 1, 2013. http://www.ncte.org/cccc/resources/positions/digitalenvironments. Council of Writing Program Administrators. 2008. “WPA Outcomes Statement for First Year Composition.” Council of Writing Program Administrators. Accessed June 1, 2013. http://wpacouncil.org/positions/outcomes.html. Del Moral, M. Esther, Ana Cernea, and Lourdes Villalustre. 2013. “Connectivist Learning Objects and Learning Styles.” Interdisciplinary Journal of E-Learning and Learning Objects 9: 105–124. http://www.ijello.org/Volume9/IJELLOv9p105-124Moral0830.pdf. Diaz, Veronica. 2010. “Web 2.0 and Emerging Technologies in Online Learning.” New Directions for Community Colleges 150: 57-66. OCLC 650836072. Dilager, Bradley. 2010. “Beyond Star Flashes: The Elements of Web 2.0 Style.” Computers and Composition 27(1): 15-26. OCLC 535530420. Doering, Aaron, Richard Beach, and David O’Brien. 2007. “Infusing Multimodal Tools and Digital Literacies into an English Education Program.” English Education 40(1): 41-60. OCLC 424828004. Ellison, Nicole B., and Yuehua Wu. 2008. “Blogging in the Classroom: A Preliminary Exploration of Student Attitudes and Impact on Comprehension.” Journal of Educational Multimedia 17(1): 99-122. OCLC 425163509. Intel. n.d. “Technology Literacy.” Intel. Accessed September 5, 2013. http://www.intel.com/content/www/us/en/education/k12/technology-literacy.html. Jansen, Jim. 2010. Use of the Internet in Higher-income Households. Pew Internet. Accessed June 1, 2013. http://www.pewinternet.org/Reports/2010/Better-off-households.aspx. Jenkins, Henry. 2008. “Why Universities Shouldn’t Create ‘something like YouTube’ (Part One).” Confessions of an Aca-Fan (blog). Accessed June 1, 2013. http://henryjenkins.org/2008/10/why_universities_shouldnt_crea.html. Johnson, Mary J. 2009. “Primary Sources and Web 2.0: Unlikely Match or Made for Each Other?” Library Media Connection, 27(4): 28-30. OCLC 425516321. Kamenetz, Anya. 2010. DIY U: Edupunks, Edupreneurs, and the Coming Transformation of Higher Education. White River Junction, VT: Chelsea Green Publishing Company. OCLC 449895015. Lankshear, Colin, and Michele Knobel. 2007. “Researching New Literacies: Web 2.0 Practices and Insider Perspectives.” E-Learning 4(3): 224-240. OCLC 593828824. Leamnson, Robert. 1999. Thinking about Teaching and Learning: Developing Habits of Learning with First Year College and University Students. Sterling, VA: Stylus. OCLS 39671176. Lester, Jim D, and James D. Lester. 2012. Writing Research Papers 14th edition, New York: Pearson. OCLS 746477415. Lo, Ken. 2006. “Digg political bias.” Ken’s Tech Tips: Helping you to get the most out of Modern Technology and Communications since 2004 (blog). Accessed June 1, 2013. http://cow.neondragon.net/index.php/1607-Digg-Political-Bias. Magnuson, Marta L. 2013. “Web 2.0 and Information Literacy Instruction: Aligning Technology with ACRL Standards.” The Journal of Academic Librarianship 39 (3) (May): 244–251. OCLC 4950915526. Miller-Cochran, Susan K., and Rochelle L. Rodrigo. 2014. The Wadsworth Guide to Research 2nd edition, Boston: Wadsworth. OCLC 847942780. Nakamura, Sarah. 2011. “Making (and not making) Connections with Web 2.0 Technologies in the ESL Classroom.” TETYC 38(4): 377-390. http://www.ncte.org/journals/tetyc/issues/v38-4. National Council of Teachers of English. 2013. “21st Century Literacies.” National Council of Teachers of English. Accessed September 5, 2013. http://www.ncte.org/positions/21stcenturyliteracy. National Council of Teachers of English. 2005. “Position Statement on Multimodal Literacies.” National Council of Teachers of English. 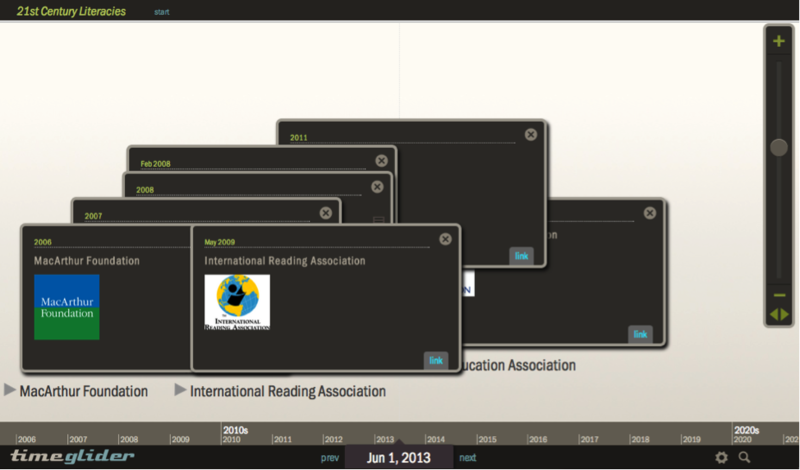 Accessed June 1, 2013. http://www.ncte.org/positions/statements/multimodalliteracies. National Council of Teachers of English. 1970. “Resolution on Media Literacy.” National Council of Teachers of English. Accessed September 5, 2013. http://www.ncte.org/positions/statements/medialiteracy. National Council of Teachers of English. 2008. “The NCTE Definition of 21st Century Literacies.” National Council of Teachers of English. Accessed June 1, 2013. http://www.ncte.org/positions/statements/21stcentdefinition. Paily, M.U. 2013. “Creating Constructivist Learning Environment: Role of ‘Web 2.0’ Technology.” International Forum of Teaching and Studies 9 (1): 39–50. http://www.americanscholarspress.com/content/IFOTS-One-2013.pdf. Palmquist, Mike. 2012. The Bedford Researcher 4th edition, Boston: Bedford/St. Martins. OCLC 726822778. Partnership for 21st Century Skills. n.d. “Framework for 21st Century Learning.” Partnership for 21st Century Skills. Accessed June 1, 2013. http://www.p21.org/overview/skills-framework. Rodriguez, Julia E. 2011. “Social Media Use in Higher Education: Key Ares to Consider for Educators.” MERLOT Journal of Online Learning and Teaching 7(4). http://jolt.merlot.org/vol7no4/rodriguez_1211.htm. Selfe, Cynthia L. 1999. “Technology and Literacy: A Story about the Perils of Not Paying Attention.” College Composition and Communication 50(3): 411-436. OCLC 425570905. Smith, Shannon D., & Judith Borreson Caruso. 2010. The ECAR Study of Undergraduate Students and Information Technology, 2010. EDUCAUSE. Accessed June 1, 2013. http://www.educause.edu/ers1006. Solis, Brian. 2009. “Revealing the People Defining Social Networks.” @ Brian Solis (blog). Accessed June 1, 2013. http://www.briansolis.com/2009/10/revealing-the-people-defining-social-networks/. Strickland, James. 2009. “Writer’s World 2.0: The Times They are a’changin’.” English Leadership Quarterly 32(1): 12-14. http://www.ncte.org/journals/elq/issues/v32-1. Takayoshi, Pamela, and Cynthia L. Selfe. 2007. “Thinking about Multimodality.” In Multimodal Composition: Resources for Teachers, edited by Cynthia L. Selfe, 1-12. Cresskill, NJ: Hampton Press, Inc. OCLC 77572962. Tambouris, Efthimios, Eleni Panopoulou, Konstantinos Tarabanis, Thomas Ryberg, Lillian Buus, Vassilios Peristeras, Deirdre Lee, and Lukasz Porwold. 2012. “Enabling Problem Based Learning through Web 2.0 Technologies: PBL 2.0.” Educational Technology & Society 15 (4): 238–251. OCLC 828866668. Vance, Lash Keith. 2012. “Do Students Want Web 2.0? An Investigation into Student Instructional Preferences.” Journal of Educational Computing Research 47 (4) (January 1): 481–493. OCLC 828867225. Weinberg, Tamar. 2006. “What I don’t like about Digg.” Technipedia (blog). Accessed June 1, 2013. http://www.techipedia.com/2006/what-i-dont-like-about-digg-bias/. Won Park, Seung. 2013. “The Potential of Web 2.0 Tools to Promote Reading Engagement in a General Education Course.” TechTrends 57 (2): 46–53. OCLC 846499361. Zull, James E. 2002. The Art of Changing the Brain: Enriching the Practice of Teaching by Exploring the Biology of Learning. Sterling, VA: Stylus. OCLC 49673202. This is the syllabus language I have negotiated with the lawyers at my former institution. To be legally “binding,” I have to obtain some form of “signed” response. engage a larger audience who may provide feedback on the project. As a student using the timeline application certain rights accrue to you. Any original work that you make tangible belongs to you as a matter of copyright law. You also have a right to the privacy of your educational records as a matter of federal law and may choose to set your timeline privacy settings to private and only share with the instructor and your classmates. Your construction of a timeline constitutes an educational record. By constructing a timeline, and not taking other options available to you in this course equivalent to this assignment that would not be posted publicly on the Internet, you consent to the collaborative use of this material as well as to the disclosure of it in this course and potentially for the use of future courses. Rochelle (Shelley) Rodrigo is Assistant Professor of Rhetoric &amp; (New) Media at Old Dominion University. She was as a full time faculty member for nine years in English and film studies at Mesa Community College in Arizona. Shelley researches how “newer” technologies better facilitate communicative interactions, more specifically teaching and learning. As well as co-authoring the first and second editions of The Wadsworth Guide to Research, Shelley was also co-editor of Rhetorically Rethinking Usability (Hampton Press). Her work has also appeared in Computers and Composition, Teaching English in the Two-Year College, EDUCAUSE Quarterly, Journal of Advancing Technology, Flow¸ as well as various edited collections. In the current landscape of Digital Humanities and digital pedagogy, it is rare to see Master’s-level graduate students fully engaged in the process of building Digital Humanities projects, especially at large, underfunded public universities. The BeardStair Project is one such effort, housed at San Jose State University (SJSU). This article, conceived and written by graduate students on the BeardStair team, provides a detailed, reflective history of that work. It started when five rare Modernist books were left, anonymously, in San Jose State University’s library drop box, and were discovered by one of the four SJSU students who became the original BeardStair team. 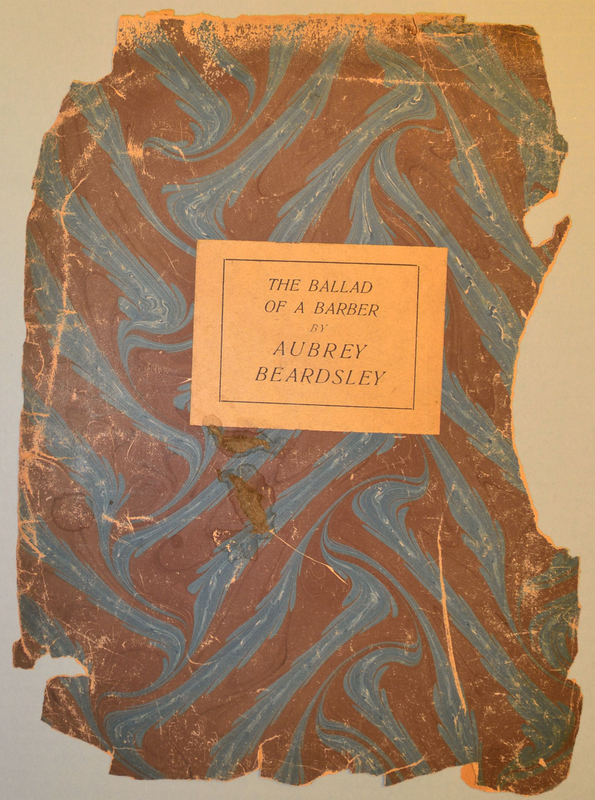 Working independently in a process of scholarly inquiry, with guidance from SJSU’s Digital Humanities scholar Dr. Katherine Harris, they began working on what they called the BeardStair Project—named for two of the books’ artists, Aubrey Beardsley and Alastair. Several semesters later, a spring 2013 course in modern approaches to literature, composed of eleven graduate students, set a research agenda of producing a scholarly digital edition of these rare books. This scholarly digital edition would be focused by the claim that “these books act as autonomous literary and artistic objects that can be valued for their merits outside, and in spite of, their original purpose as salable commodities.” The BeardStair Project is an ongoing experiment in the Digital Humanities, yielding unique implications for administrators, faculty, and students who are interested in building Digital Humanities projects and fostering collaborative digital pedagogies. Beginning in the fall of 2011 as a loose yet focused and fruitful student collaboration, and extending through the spring semester of 2013 (with an open door to future instantiations), the BeardStair Project is a unique and collaborative student-run Digital Humanities project at a large, under-funded state university. This is a history of what happened in that project (especially in its second instantiation), with the goals of illustrating the immense value of Digital Humanities work in English and Humanities Departments, as well as the persistent progress that can be made at any institution when the Digital Humanities are embraced. The original BeardStair participants began the project in Fall 2011 when five old, mysterious illustrated books were left by an unknown party in a book-return bin at the San Jose State University campus library. Jesus Espinoza, a student who worked at the SJSU library at the time, brought the books to Dr. Katherine Harris, whom he knew from an undergraduate Digital Humanities course offered in a prior semester, a course that also discussed the history of the book. After doing some initial research on the discovered books, Dr. Harris discovered that two of the books, being rare editions with original artwork, were potentially valuable. She felt compelled to get students involved in making a digital edition of these valuable, cultural, literary, and historical resources. Of the artifacts that were most compelling there was a 1920 edition of Oscar Wilde’s poem, The Sphinx, a dramatic monologue ripe with Wilde’s wit and eloquence. There was also Sebastian van Storck, Walter Pater’s 1927 tale of a nihilistic Dutchman who achieves a tragic redemption by sacrificing himself to save a child, which was beautifully illustrated by Alastair. 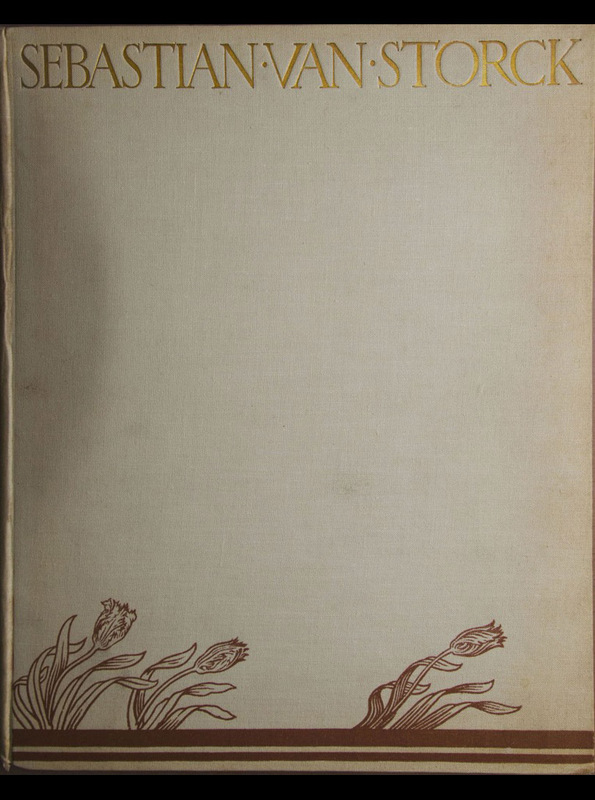 Finally, there was the Aubrey Beardsley’s 1919 edition of The Ballad of a Barber, a poem in ballad form that focuses on man’s aesthetic limitations. Dr. Harris tweeted and emailed some former students who she thought might be interested in exploring and presenting research about the books. Four student participants, including Jesus, accepted and got involved in what became the original BeardStair project. They began by independently researching the books, their authors, artists, interpretations, and histories. The mix of undergraduates, graduate students, and former students met once a month to report on their research findings, ask new questions about the books, and set research goals for the next meeting. Dr. Harris served as a kind of project manager and advisor, but primarily, the students were in control of the research agenda and the act of researching. Eventually, the group accumulated enough intriguing information to present their findings at conferences and competitions (THATCamp Pedagogy, Re:Humanities Conference, and the CSU Student Research Competition). However, because of a lack of funding and support from the university, these original BeardStair participants ran out of steam. In an effort to continue the project and award students with tangible success with regard to the project, Dr. Harris received approval to offer a graduate-level Digital Humanities course. The result was one of the most collaborative and exciting learning experiences many of these students had ever had the opportunity of being involved in. A seminar in modern approaches to literature was added to the course schedule, giving university credit to eleven graduate students who reviewed the original BeardStair participants’ work, set tasks and goals for the semester, read scholarly editing theory, engaged in Digital Humanities debates, and moved the Project toward its inevitable goal: to produce a digital scholarly edition of the works. In order to accomplish that goal, BeardStair participants had to be able to communicate effectively, and, after considering multiple options, in the classroom and out of the classroom, BeardStair decided to use a social media website, Facebook. Facebook afforded BeardStair participants some crucial advantages in developing the project. 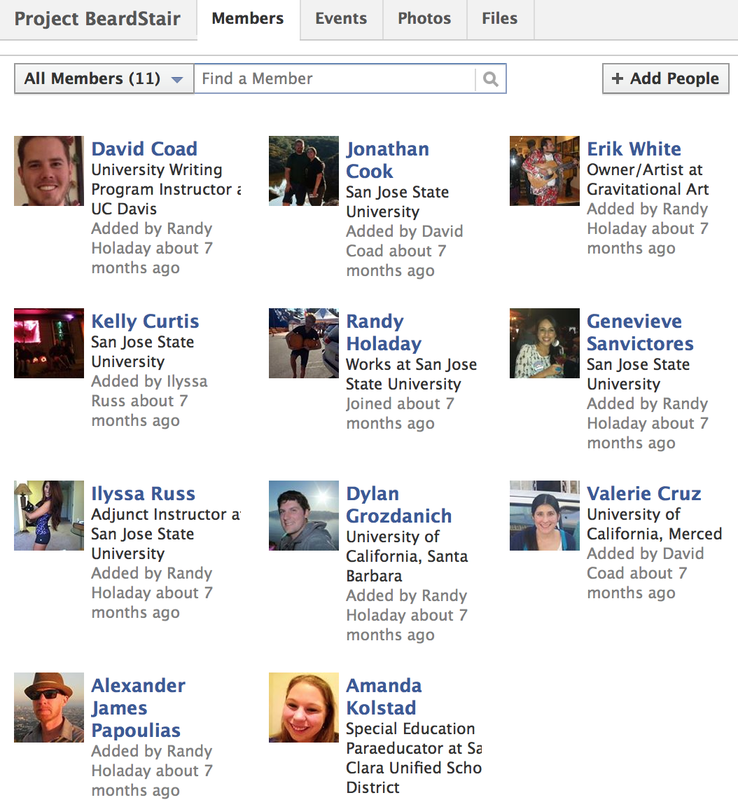 First, Facebook is free, and groups can be created that are accessible via invitation only. BeardStair participants used Facebook in exactly that way to great effect: creating a collaborative group; and circumventing faculty interference (after all, they felt it was truly their project) and other potential hijackers. Facebook, as a social media construct, proved invaluable to the development of BeardStair ideas; indeed, Facebook allowed for the free exchange of ideas in an area most of us were already very comfortable working in. Individuals that would not normally speak in a classroom setting posted to the group message board, ideas flowed more freely, and progress was made more efficiently. And, when the time came to decide what direction the BeardStair Project should travel, Facebook was a capable medium for genesis. The BeardStair Project needed a foundation, a vantage point from which to engage the texts. Roland Barthes’s discussion of the plurality of texts in his essay, “From Work to Text,” was especially important in developing such a perspective. Barthes wrote that the text is “irreducible” and “accomplishes the very plural of meaning” and textual meaning is represented as “an explosion, a dissemination,” whereby the “plural of the Text depends…not on the ambiguity of its contents but on what might be called the stereographic plurality of its weave of signifiers” (Barthes 1978). This analysis became the basis for Project BeardStair’s interpretive perspective, for BeardStair participants did not simply want to extract meaning from the found texts, as if they were simply a precious resource to be harvested, but, rather, to examine the texts as a whole—as part of a continuum—as representative of their time and artistic/cultural milieu. In short, BeardStair wished to find Barthes’s “weave of signifiers” throughout the artifacts, to sense these connections as a unified tapestry that might, with new light, elucidate an overlooked period of literary history. Naturally, Barthes’s ruminations were quite complementary with regard to the BeardStair paradigm of collaboration. The reason for this was no coincidence, as BeardStair was, and is, deeply indebted to the core tenets of Digital Humanities studies as indicated in Dr. Harris’s (2013) recent article, “Play, Collaborate, Break, Build, Share: ‘Screwing Around’ in Digital Pedagogy, The Debate to Define Digital Humanities…Again.” Chiefly, the BeardStair participants employed collaboration, the willingness to explore multiple interpretations, and, equally important, a right to fail in the name of progress. There was always an essential need for fluidity in the BeardStair project—controlled, cohesive, cogent, yes, but absolutely fluid and adaptable. Digital Humanities is the only humanities field that affords that kind of freedom. Yet, even with freedom comes the inevitable burden of choice. The BeardStair Project needed a medium with which to engage its audience. BeardStair wrestled with the idea of the “text,” vast as it was. Barthes provided a theoretical background, but there remained the issue of presentation from classroom conception to audience consumption. BeardStair had to choose between a digital archive of its texts or something more. The BeardStair participants’ understood that while a digital archive preserves and displays the material items along with secondary sources that relate to the items, they lack several fundamental elements, including the ability to include other scholars’ ideas in the discussion and to make an actual argument about the materials, which BeardStair participants found essential when it came to defining their project. In their search for a method of defining the project that would include the fundamental elements they wanted to present, they confronted, in a different arena, the age-old question: what is a “text”? BeardStair considered displaying the texts online with findings and research, but that approach ignored the crucial, argumentative properties that BeardStair members thought important. BeardStair participants felt that if texts were merely collected, reproduced, and digitally stored, then the archival properties would not give the project the ability to develop a thesis and make an argument regarding the books’ intrinsic and extrinsic values. The BeardStair participants acknowledged that by virtue of being archived, there would be an inherent argument about the books’ intellectual value. Whether one physically or digitally presents a text in an archive, one is making an argument about that text’s relevancy, importance, genre, and historical context. Yet an archive ostensibly grants an immense power of interpretation to archivist(s). BeardStair students were not convinced of such a strictly archival stance as such a position alienates the author from the historical context of the text, proposing that it may be manipulated for different purposes or motives from the original author’s intentions. In other words, the BeardStair project is motivated by the idea of disseminating the power of interpretation of value to a broader authorship that extends beyond the participants themselves. Students who participated in the BeardStair project, in keeping with the spirit of Digital Humanities and collaborative efforts towards projects and arguments, wanted to utilize an approach that satisfied the efforts of the project while embracing the academic community and the public at large. Thus, BeardStair students decided to produce a scholarly edition. With a scholarly edition BeardStair participants were free to posit an argument without the risk of alienating or dismissing dissenting opinions. The scholarly edition functions much like an open forum—like any article of scholarship—in that it demands conversation, agreement or dissension aside. While the digital archive is honed and bent by the will of an individual, represented as truth, the scholarly edition represents the acceptance of plurality and the possibility for a true dialectic. The BeardStair project is, fundamentally, constructed to be inclusive of the world at large. In support of such lofty goals, the project now has a working website, a digital mark-up protocol (TEI) for the text of an entire book, critical essays on all the books and artists, a project rationale (aforementioned), and a thesis that argues the value of the books’ place in the Modernist era. As the semester progressed, BeardStair participants recognized a need for a Digital Humanities lab at SJSU and crafted a funding proposal highlighting the production needs for a project of BeardStair’s scope. Such projects are the realization of the potential of Digital Humanities studies and are essential to its survival, especially from an institutional/academic standpoint. BeardStair members are amazed and proud with what they have accomplished without funding support. The inclusion of a designated DH space could only bode well for future instantiations of the BeardStair Project. The following is a complete project history of BeardStair to date. 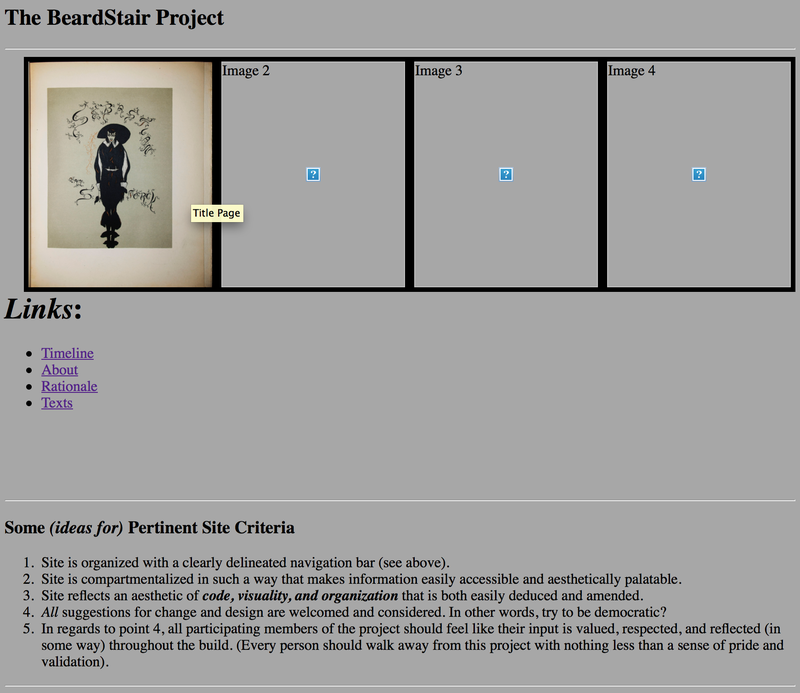 Much of the information here is drawn from blog posts on the class website, “The BeardStair Project: A Graduate-Student Driven Digital Project” (Coad et al. 2013). Here, in this boiled-down history, readers can immerse themselves in the origins of the Project and join the journey of the Spring 2013 collaborators. We’ve chosen to present the history in a chronological timeline so that others can read about successes and failures, and most importantly, engage with the process of creating an elaborate Digital Humanities project. It is the sincere hope of all of the BeardStair members, past and present, that readers of this piece will be inspired by what they read, our absolute commitment to collaboration, our fraternity of scholarship; we, BeardStairs, hope that the world—both academically inclined or otherwise moved by curiosity—will share in the joy of our labors, the successes and the failures we’ve had. It is our wish that this interactive history, full of images and links to course schedule and blogs, will inspire similar projects and adventures—that others might join us down the rabbit hole. Early September 2011 Jesus Espinoza finds five rare books, not SJSU library property, left anonymously in the library return bin and flips through the profusely-illustrated pages. The images and the books’ quality remind him of an Honors Colloquium that he had taken with SJSU Digital Humanities and book history scholar, Dr. Katherine D. Harris. He brings the books to Dr. Harris and she determines the books’ handmade paper and uncut pages signal valuable book history. These books are original editions, yet far from pristine. Some are in better shape than others, but all show some signs of decay. However, the physical attributes of these books indicate the potential for valuable literary and historical examination relating to the method in which they were produced. Jesus immediately begins crafting a research project around these found books. Dr. Harris, Jesus, Colette Hayes (MLIS School of Library and Information Science student), Doll Piccotto (MA English), and Pollyanna Macchiano (BA English) form a volunteer research group that meets off-campus monthly. They discuss the books and uncover their mysterious past. 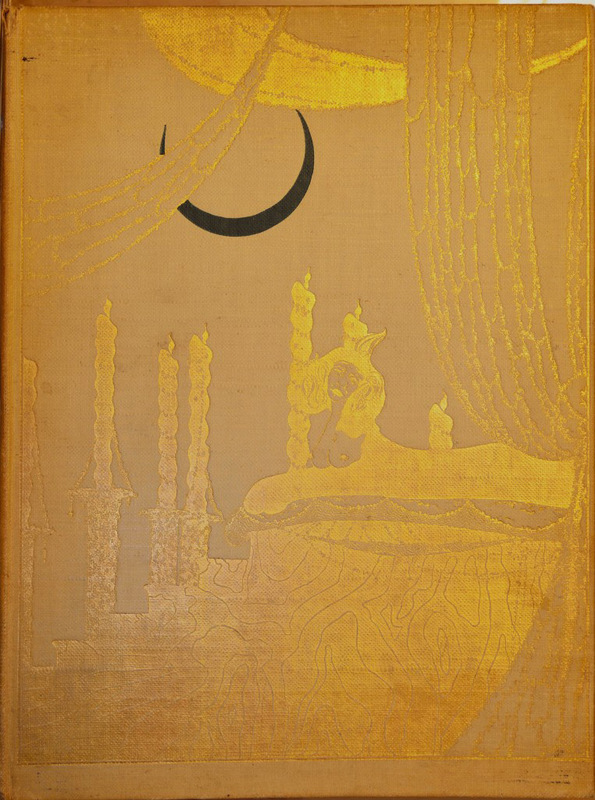 The group decides the lavish color illustrations by artists Aubrey Beardsley and Baron Hans Henning Voigt (known simply as Alistair), should dominate the project. They decide to call their group, “BeardStair.” The group dreams of preliminary goals, the first of which is to exhibit the books in King Library Special Collections. The second is to construct a peer-reviewed digital edition, supported and maintained by the library and a scholarly community. The Original BeardStair participants spend four months delving into every facet of the works – from their mysterious dumping into the SJSU library bin to the collective importance of Modernist artists’ books. The project beginnings are shared in detail at the blogging site, BeardStair.wordpress.com and in a fairmatter.com blog post called “Giving Students the Keys: Digital Projects” by Katherine D. Harris. November 28, 2011 The “Student Driven Project: BeardStair” blog post at triproftri is acknowledged as an Editor’s Choice for Digital Humanities Now. BeardStair participants are inspired to find out that the Digital Humanities community is watching their pedagogical experiment. February 23, 2012 Pollyanna Macchiano gives a presentation on BeardStair called “The Underground Voice in Digital Humanities” at THATCamp Pedagogy. The Digital Humanities community has begun to notice the BeardStair Project as a multilayered experiment in both old books and new ways of engaging with the humanities. Phase Zero marks the continuation of the BeardStair Project by SJSU M.A. and M.F.A. students in a classroom setting. Dr. Harris opens with the caveat that this is a collaborative learning environment and the group is encouraged to think outside of traditional humanities, collaborate, and embrace failure. To start, some assignments are posted to the blog site and the schedule of phases (a step-by-step plan of the collaborative work we want to accomplish throughout the semester, adhering to a set of codified student learning objectives introduced by Dr. Harris at the outset of English 204) is developed with the enthusiasm of meeting key semester objectives: By the conclusion of the course, we will have added to BeardStair Project and will (ideally) submit it for review by NINES, a peer-review entity for nineteenth-century digital projects. In essence, students will immerse themselves in the burgeoning field of Digital Humanities in order to contribute to a real-world scholarly publication. Working within a set of core student learning objectives (SLOs), the English 204 group sets out to accomplish goals by first conceding a few truisms, borrowed from Professor Matthew Kirschenbaum’s English 668k course website at the University of Maryland, which states that not all questions would have been answered; not all texts would have been read; all avenues of experimentation would not be exhausted; and the entirety of Digital Humanities would not be explored. The inception of BeardStair embraces Kirschenbaum’s SLOs, but the execution of BeardStair, in its current form, is reflective of Dr. Harris’ English 204 SLOs in that the group functions as a collaborative unit with a final, multimodal project being created at semester’s end. Above all else, Project BeardStair was/is an experiment, with all respect and reverence given equally to success and failure. The class discusses the definition of Digital Humanities, the essence of collaboration, and catches up on where the original BeardStair participants left off. They are introduced to the physical books and divide into two groups–the Technical Group and the Literary Group–with the objective of covering all project phases. 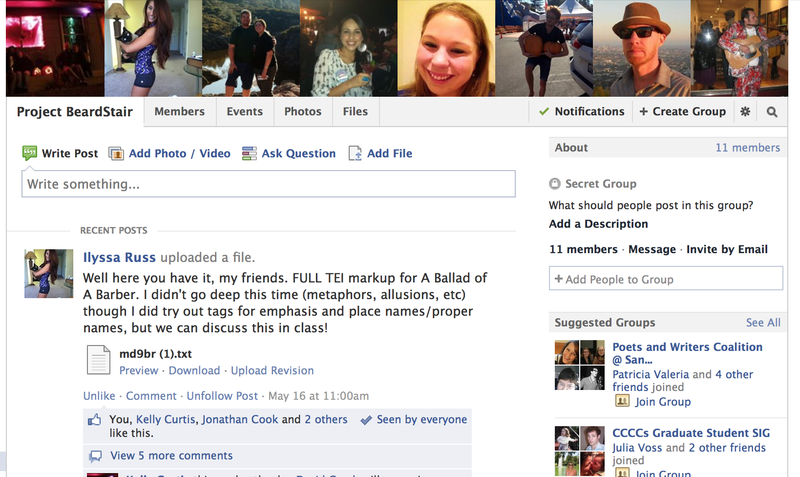 Each group creates its own private Facebook group page for efficient communication, brainstorming, and sharing documents. These Facebook groups become instrumental in organizing, sharing ideas, posting documents, and keeping group members accountable. Facebook will become the single most effective method of collaboration the BeardStair teams use. February 7, 2013 Team members continue to read and research the theory of Digital Humanities and what it means to do DH. They come to understand that the Digital Humanities involves the use of digital tools to represent material items and the secondary resources that discuss them. It’s determined that each week both Lit and Tech groups will prepare a blog post to share our process and document progress. The Lit Group’s initial action is to familiarize themselves with the Project, both the books and the research conducted by the original BeardStair members. They process this material into summaries so that, moving forward, research can be done without requiring use of the physical books. The Tech Group reviews several digital archives to discover positive qualities of functioning projects similar to BeardStair. These digital archives, however, appear to only present the primary materials and secondary documents and do not make a community argument about the value of the texts, something BeardStair participants believe is important to their project. February 14, 2013 The class continues discussion on digital publications and determines that the category of publication the Project best fits into is “digital scholarly edition.” All class members write an individual blog on the “anxiety about sustainability, project management, productive unease, scholarly editing, or building.” Meanwhile everyone thinks seriously about how to define the BeardStair Project. The main question is: Are we creating a digital scholarly edition or a digital archive? They determine that digital scholarly edition best fits the Project type because they aim to present the materials, make an argument about their value, and allow scholars from the broader community to comment and make their own summations of the works, either in agreement or disagreement with BeardStairs’. A digital archive would meet the first two goals of sharing the works and secondary sources about the works, but it would not allow for input from outside the project members, which seems to go against the original values of the participants. The Tech Group begins “articulating a structure for our digital project” and creates GoogleDrive documents that contain features the Project should include. They consider using a timeline to articulate the project using Dipity.com. After looking into whether their books already have digital editions, and not finding any, they are reaffirmed in the value of this project. They consider working with The Internet Archive to house the digital editions. They also research metadata and advocate creating metadata for the Project. The Lit Group publishes materials to the class’s private Google drive, including summaries of each book, brief contexts, descriptive bibliographies, and the start of an annotated bibliography. Here, the group shifts from gathering and understanding the Project as it had been left by the original BeardStair participants into new areas of research guided by the class’s interests: publishing houses, materials, and the artist Alastair. The class discusses mark-up and sustainability and discusses goals for the Development Phase. The group acknowledges the need for a thread between the books, a thread that can be explored in research and could be presented for publication. It is determined the class wants to get the Project online by the end of the semester, but they also see a need to present an argument rather than a haphazard publication of the materials. Following research leads Dr. Harris discovered through Twitter, the Lit Group decides the BeardStair books are actually part of the livres d’artistes genre, as defined in Johanna Drucker’s book, The Century of Artists’ Books (1995). The discovery’s significance is twofold: it begins to make cohesive each member’s different area of research, and the collaborative nature of livres d’artistes lines up nicely with the collaborative nature of the BeardStair Project, connecting the literary aspects to the larger discussions about Digital Humanities which seems to circle a debate about where the emphasis of DH should lie: on digital tools, or the people that use them? The Literary Group provides the first sketches the Project’s structure based on their research about livres d’artiste books. The Tech group researches mark-up and the Text Encoding Initiative. 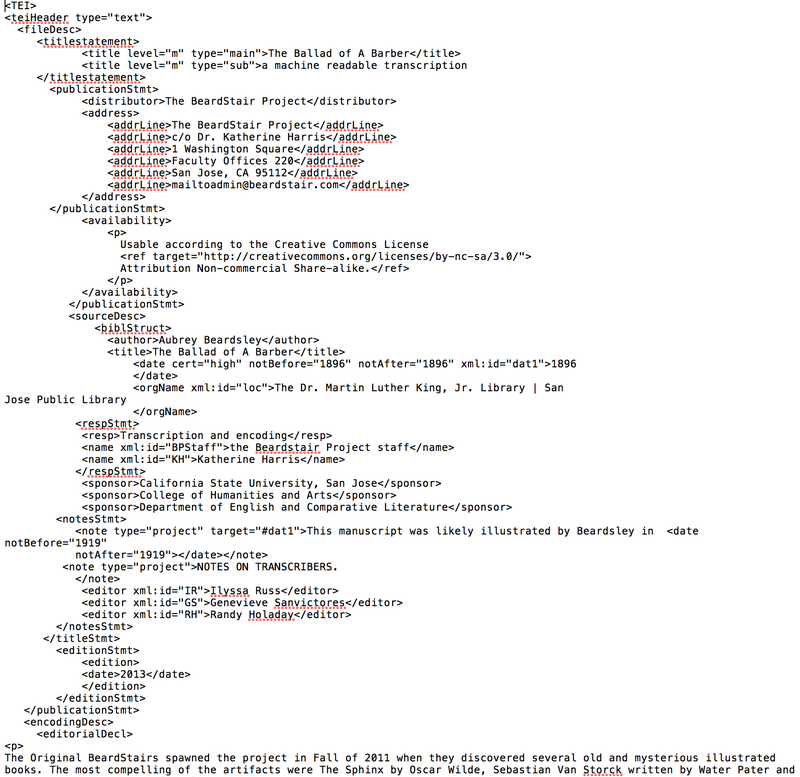 TEI is XML streamlined and requires knowledge of coding. It also has its own set of guidelines that requires assimilation of new rules and standards. The Tech Group determines that implementing TEI will require either an immense investment of time, or outsourcing, which would be problematic because it would cause us to lose control over the Project’s argument. This discussion of TEI leads the BeardStair participants to think about how they are going to define “text,” and what we want to accomplish with the texts we have. They look for advice and an understanding of “text” to James Cummings’s “The Text Encoding Initiative and the Study of Literature” (2008) and an article by Stephen Ramsay and Geoffrey Rockwell, “Developing Things: Notes toward an Epistemology of Building in the Digital Humanities” (2012) and come to the conclusion that “text” acknowledges a continuum of works that share connections. Essentially, this is how they explain how BeardStair is linking the disparate textual volumes they have used. March 7, 2013 In the spirit of collaborative group work, they complete their first peer evaluations using the Association of American Colleges and Universities’ online Teamwork Value Rubric. Completing evaluations of one another’s work leads to a focused group assessment of how well the Lit Group is functioning. The result is a reinvigoration of collaborative effort, individual accountability, and renewed group dynamics after the group had struggled to cooperate. During this class meeting, the BeardStair participants discuss “epistemology” and “hermeneutics” in an ongoing effort to determine “What is our argument?” They brainstorm and establish goals for the entire Project, and determine what can be completed in the remainder of the college semester. They also discuss a possible structure for the Project argument. Figure 8. BeardStair Website Dreaming… If time and money were no object. The Tech Group works on two prototypes for the audience interface. One is an e-book style presentation, and the other is an html presentation. They continue to research TEI and markup and consider how much is realistic to include in this project considering the timeline. BeardStair participants are interested in the concept of the text as an “artifact.” The quality and production of the books is of interest as well, which seems to imply that the Tech group and Lit group are on the same page regarding the “material” thread. The Tech Group is reminded that the quality of BeardStair images must represent the materiality of the books. The Tech Group reviews The Omeka project developed by the Roy Rosenzweig Center for History and New Media at George Mason University and the Scalar project developed by the Alliance for Networking Visual Culture at the University of Southern California and find that the open-source scholarly publication projects offer a possible publication venue for BeardStair. The BeardStair participants have been discussing what type of argument to make by asking questions about what they want the public to get out of their experience with the books. They ask, What do these books say? What does BeardStair want them to say? They determine that they would prefer a peer-reviewed publishing platform, but there is debate about whether the group will be able to pull together all the writings and materials in time for peer review. The group discusses using Scholarly Editing as the publication site. There is still ongoing discussion and inquiry about using Omeka or Scalar as publishing platforms. The Lit Group produces the first formal drafts of the context for the webpage and posts them to the Google Drive Master Documents folder. This brings about unanticipated questions of style and formatting. Members of the group also start thinking about the theoretical framework for the Project, mainly surrounding questions about the significance of the artwork present in the “commercial” livres d’artistes. The Tech Group is still working on a scanned version of the books and is determined to provide a facsimile showing the jagged edges and watermarks. They work to find the appropriate medium in which to convey these images, but the digital files for the Project are huge, the data is immense, and time is limited. BeardStair has made some progress in terms of types of digital tools and the kind of digital interactivity they want. They determined they need an HTML version and a PDF version of all books. One Tech Group member is learning XML/TEI markup, so it is possible that they could include an XML version by the end of the semester. They hope to include a flipbook viewer like DjVU or Daisy. They are also considering including a forum that allows viewers to post comments and ideas. March 21, 2013 The group chooses a project historian to document successes and opportunities for the project’s About page. BeardStair participants are getting serious about avenues for online publication. Scholarly Editing has responded that they accept projects submitted with multiple authors or strict limitation on images. Lit Group has been in contact with Scalar to get advice on the use of Scalar as the BeardStair platform. It is unknown when Scalar will be available to the public. The Literary Group settles on Modern Language Association as a standard method of citation. This week also begins the editing stage. Each individual in the Lit Group shifts the focus away from his or her own writing to the writing of other group members. This also brings the focus of the Lit Group more to the end product, creating questions of scope, specificity, and breadth of research. The larger class asks the Lit Group to begin thinking about a thesis for the Project, which they are resistant to doing because they don’t feel research is complete yet. The Tech Group questions how much server space the digital edition will require and grapples with finding a host. The group leans towards Scalar, but still questions if they have enough hands or time to add detailed metadata. The project is still struggling with the large size of images required for publication. A mock-up of the website is developed for class discussion and review, and refreshes the class’s excitement and enthusiasm about the project. The Literary Group completes all formal drafts of contextual writing that both presents their research on the authors and illustrators related to the BeardStair Project and examines the value of artists’ books of the Modern period. April 4, 2013 The Tech Group chooses a new team leader to give another member the opportunity to have that responsibility. The BeardStair participants are now three weeks into what they had originally estimated would be the “building” phase of the Project. At its April 4th meeting, a small gathering of collaborators discusses the first draft of the Project rationale and the first draft of a Project history. This is a milestone in the Project because both groups felt directionless without a thesis to argue and move forward with. The group decides to look into creating a Kickstarter campaign to fund the Project, but at this point, one member buys server space to host the website because he sees the need to push forward. The Project tried to avoid this common Do-It-Yourself approach to the Digital Humanities, but funding opportunities are limited. April 11, 2013 After much deliberation and collaboration BeardStair settles on a Project thesis: “We claim that these books act as autonomous literary and artistic objects that can be valued for their merits outside, and in spite of, their monetary direction.” This argument, that the books have intrinsic value, is a rebuttal to Johanna Drucker’s (2005) ideas about the genre that argue such artists’ books were only of commercial value. BeardStair will continue working on a Project rationale with the developing thesis in mind. Over the next week, they will also explore Omeka and its potential as a platform for the BeardStair Project online. BeardStair buys a domain name and some server space for the website www.beardstair.com. The group had discussed creating incentives for contributors who would donate to BeardStair Project through Kickstarter, such as early releases or expanded access. However, because BeardStair participants want the project to be freely accessible to all and have no intention of creating competition between outside contributors, but would rather increase collaborative efforts from the greater community, they decide against seeking funding through Kickstarter. Instead, they discuss putting a “donation” button on the web page to help recoup some of its out-of-pocket costs due to lack of departmental and university funding for Digital Humanities. Several BeardStair team members are continuing to learn TEI, though it’s a struggle. They try to gauge the amount of time it might take to create TEI for all the books’ content. The discussion turns to “big picture” ideas, particularly the lack of university funding for Digital Humanities. Dr. Harris proposes that team members work on a funding proposal for a DH center at SJSU. The proposal will need to touch on space, materials, and funding support needed for such a center. As importantly the proposal will need to address questions such as: Why have such a center? How would it enhance our education? How would a DH center help with the completion of a project like BeardStair? The BeardStair class also reorganizes the teams to reflect the new work-groups needed: TEI, Project History, Omeka Group, and Funding Proposal. The role of the BeardStair historians is determined as one that formulates a readable work that points to significant conclusions about the project’s process. The historian is not so much concerned with whether BeardStair meets its goals but more with the milestones that changed the process and evolution of the project. The team looks at several ways to share their history: a narrative, an interactive timeline, or a scholarly essay. Thinking realistically about the time left in the semester, the team settles on an interactive timeline with short narratives to elaborate on team milestones. April 18, 2013 Each group continues development of their sub-areas of BeardStair. TEI mark-up for the title page and header of Ballad of a Barber is completed and the TEI goal for the end of the semester is to create a header for each book and complete all TEI markup for Ballad of a Barber. 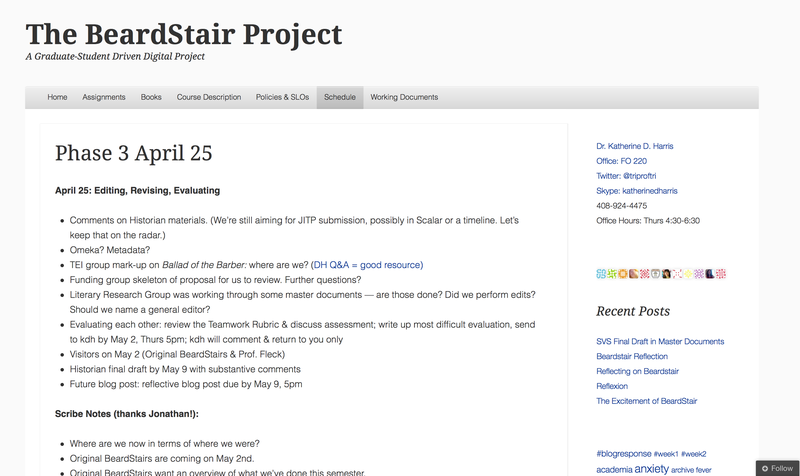 The Project Historians comb through class notes, blog posts, and the class’s weekly schedule, along with reaching out to the original BeardStair team, to produce a cohesive history of the project. It is decided that at the second-to-last meeting, the group will discuss publishing on pedagogy in a scholarly journal. The funding group continues work on a draft of the funding proposal letter, and has contacted Costal Carolina University to ask for advice about creating a small lab. This week, the funding proposal group has shared an outline of its draft with the team in its blog post and asks for input and suggestions regarding goals and specifics. April 25, 2013 The week begins with a discussion on the Team Rubric Evaluations each member will complete for all class members at the end of the semester. Also the BeardStair participants are asked to prepare a blog post for the final week of class addressing skills–both hard and soft–learned in the class. The funding group creates a spec-list for a potential Digital Humanities center, using its own Incubator Classroom and other DH centers as examples. The Omeka group arrives at an adequate solution to the problem it has had with pictures, and can now represent the photographed texts in their entirety as PDF documents. Omeka–a free open-source platform that appears to have a large and dedicated enough following that it should remain supported for some time–looks viable, and the group has hosting space ready. 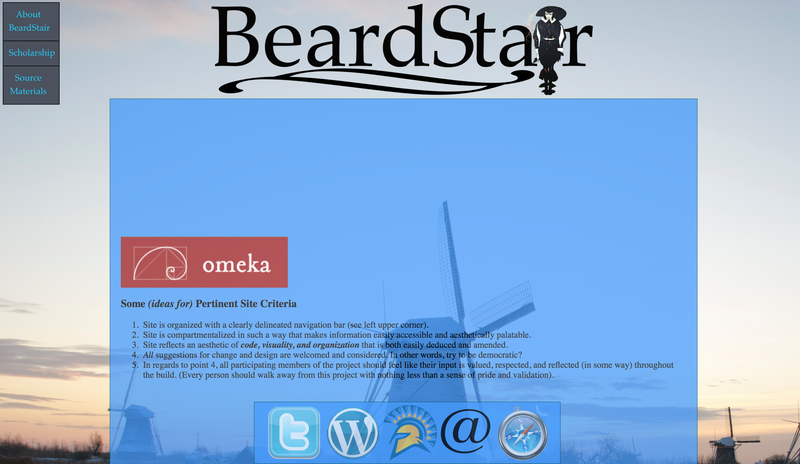 Implementation should require incorporating BeardStair’s aesthetic and functional ideas into the Omeka site. The historians have settled on using a timeline with short narratives as the format. This should be a concise and navigable way to highlight project milestones. Dr. Harris has been diligent about recording weekly events, decisions, and discussion topics; and the groups have also been consistent about posting blog entries that we have been drawing from to write the project history. The TEI group continues with its learning tutorials. They are eager to learn the text encoding protocol, but admit progress is slower than they had hoped it would be. Their hope is that they will each be operating on the same level of proficiency soon, and will be able to reach their semester goals. Original BeardStair founding member, Jesus Espinoza, joins the team for the meeting, and hears a presentation about the semester’s activities. The historians share their latest draft and ask for the group’s input. The group sees a mockup of the BeardStair’s Omeka site. There is a draft of the project rationale, and the group is asked to review and provide feedback during the coming week. The meeting concludes with some things to think about: What will the next instantiation of this group do? Where does the next team pick up the BeardStair Project, and where will they take it? The TEI group uses several new tutorials (www.codeacademy.com and www.w3schools.com) and reports learning has become easier, though the TEI process is still time-consuming. The header for Ballad of a Barber is done, and coding of the text is underway. TEI headers for The Sphinx and Sebastian van Stork will follow. The funding proposal group drafts several proposal letters for various audiences. They work to revise the funding letter to the SJSU Humanities and Arts dean and identify and revise it for specific audiences, such as national grant making organizations. They ponder how to communicate the exciting possibilities of a SJSU Digital Humanities center and how to articulate the purposes of the DH Center. May 9, 2013, Last Meeting of Spring 2013 The team is required to revisit the idea of “done” and reads the Digital Humanities Quarterly essay “Published Yet Never Done” (Brown et al. 2009). Regardless, the BeardStair team members cram to meet goals and deadlines before the end of the semester. They review the written documents on all books, check the Omeka mock-up and read and comment on the Project Rationale. The TEI group brings the headers for each book and a complete mark-up of Ballad of the Barber will be ready by the conclusion of the course. The Funding Group has a strong draft of the funding proposal and a final draft of the Project History will be ready by May 16 for the faculty advisor’s comments. The group is still thinking about sending one TEI book with documentation to Scholarly Editing. Also, each BeardStair team member is privately working on a Team Value Rubric for one another to assess each individual’s contributions to the Project and effectiveness as collaborators. Everyone has been working on a To-Do list for the next installment of BeardStair so the torch can be passed efficiently and the goals of the original BeardStair participants and this graduate class stay in sight. The BeardStair Project started with the discovery of five old, rare books in the San Jose State University Library. Who dropped them in the returns box? Are they valuable? What are Artists’ books anyway? The new, impromptu custodians of the books dubbed themselves BeardStair and their curiosity quickly grew into a passion. They wanted to know everything they could about the books as soon as possible. To support that passion, they developed a set of informal values surrounding their exploration. Those values–deep respect for the books and an enthusiasm to share them with the greater community–have been passed from one iteration of the BeardStair Project to the next. The exploration of Modernism, the livres d’artistes genre and the desire to illuminate the works for the academic community is nothing new to the School of Humanities. What is emerging in the school, and what the original BeardStair participants naturally found in themselves, is the desire to make the works accessible to all, online, for free, in a live discussion. This passion for sharing the books’ intrinsic and extrinsic value has become the most important aspect of Digital Humanities for the BeardStair participants. The BeardStair Project itself had a rocky and intermittent start. Originally, the team performed informal research and met for dinners to discuss findings. After months of what their adviser referred to as “down the rabbit hole” enthusiasm, the team of volunteers found that for the project to meet the goals they had set based on their values, the project would need more nurturing than they could give. They simply didn’t have the labor power, technological resources, funding, or university backing to get the books onto the web and out to the world. This under-resourcing problem seemed to point to possible approach to the Digital Humanities that could result in the completion and continued growth of projects: collaboration. When the Spring 2013 graduate class took over BeardStair in January, they had more technology (though still, a full service DH lab remains a dream), they had almost three times as many people working collectively, and they had some, albeit minimal, university backing. (SJSU provided an incubator classroom and granted course units toward individual Master’s degrees.) Several aspects of working collectively quickly became essential to the new team. They developed project phases and To-Do lists to keep them moving toward their goals. They assigned strong leaders and used technology to communicate regularly and to hold themselves accountable for individual deadlines. They used teamwork rubrics as a way of getting and giving feedback to their peers. The collaboration itself was a powerful tool for moving forward with BeardStair, but perhaps the most important value the team developed was unabashed creativity which was unencumbered by the fear of failure and the fear of incompletion. Letting go of the long-held belief that one must finish a project to be successful allowed the team to create new ideas of expression and take the presentation of the books on a new path, a path that better represents the value of the books themselves. While the Spring 2013 team did not accomplish every one of their goals for the semester, they did learn to see that BeardStair, as a Digital Humanities project, is an organic, living thing. The team finished their semester with a To-Do list that enabled them to pass the torch to the next generation of members who hopefully will develop their own values, creativity, and goals for the project. Additionally, from the university perspective, the Spring 2013 graduate-level Digital Humanities class was a success. While there may be few tangible products generated by the class, it’s clear by looking at the project history that each of the San Jose State University English Department student learning objectives was met. Students gained a more complete understanding of the Modernist period and the literature it generated. They completed significant amounts of research and produced critical write-ups of their findings that will be posted online with the project. Also, they were very prolific with the written word and their own interpretations of Digital Humanities through their weekly blog posts. Dr. Katherine Harris blogs extensively on the SLOs in relation to the conclusion of the 2013 BeardStair Project class in her fairmatter.com blog post called “BeardStair.” From the perspective of the students who participated in the Spring 2013 Digital Humanities class at SJSU, the class offered learning opportunities beyond the English Department student learning objectives. Collaboration, resolving conflicts with peers, spearheading projects without the overt influence of a faculty adviser, and giving new meaning to the essence of what it means to “finish” a project, were among the skills learned in the BeardStair class. These skills are applicable in both academia and the greater working world. Each student who participated, and whomever will participate in the future, in projects like BeardStair knows the value of the Digital Humanities and what they offer in the university setting. “There is one major difference with this class than my other classes as SJSU. In my other three classes this semester, I’m turning in something that is done. I’ve done the research, the writing, the proofreading, and I’m done – here ya go – goodbye. In Digital Humanities we did all the work, research, writing, proofing, and there’s more to go. This Project will never be done, because it’s digital. It’s a mold-able modality. “My experience with collaboration had previously been limited to undergraduate “group projects” which usually ended with me doing the majority of the work. So, I walked into a huge challenge; this class was collaborative and technological, so I tried to let go of control and tried to just ‘let it happen.’ … I struggled… I struggled a lot… Because I was so used to working alone, and only being accountable to myself, I decided ‘not to bother my group until I found something worth sharing.’ This was not a successful choice. Without communication about my process and progress, my group was left believing that I wasn’t contributing. This was perhaps my biggest challenge with the course; I had to learn to communicate, even if I felt like I had nothing to report. “While the course definitely examined the question of how the humanities can embrace technology, I think that first and foremost it has been an experiment in collaboration. In many of my other graduate seminars research is done privately and papers are produced in solitude. While students often share their paper proposals and results in class, the work is left entirely up to the individual student. Coad, David, Jonathan Cook, Valerie Cruz, Kelly Curtis, Dylan Grozdanich, Randy Holaday, Amanda Kolstad, Alexander James Papoulias, Ilyssa Russ, Genevieve Sanvictores, and Erik White. Faculty Advisor Katherine Harris. 2013. “The BeardStair Project.” Accessed May 16, 2013. beardstair.wordpress.com. Cummings, James. 2008. “The Text Encoding Initiative and the Study of Literature.” In A Companion to Digital Literacy Studies, edited by Susan Schreibman and Ray Siemens. Oxford: Blackwell. OCLC 259753413. Drucker, Johanna. 1995. The Century of Artists’ Books. New York City: Granary Books. OCLC 33826276. Ramsay, Stephen and Geoffrey Rockwell. 2012. “Developing Things: Notes toward an Epistemology of Building in the Digital Humanities.” In Debates in the Digital Humanities, edited by Matthew K. Gold. (Minneapolis: University of Minnesota Press). OCLC 759909869. Pater, Walter. 1927. Sebastian Van Storck. London: John Lane. OCLC 2362195. Wilde, Oscar. 1920. The Sphinx. London: John Lane. OLCL 5777162. David T. Coad is a PhD student at UC Davis in Education with an emphasis in Writing, Rhetoric, and Composition Studies. He is interested in multimodal rhetoric, social media, and writing pedagogy. David graduated from San Jose State University with an MA in English, where he was grateful to get to work on the BeardStair team, and has recently been published in <i>Kairos</i> and presented at CCCC. Kelly Curtis will receive a Masters in Fine Arts in Creative Writing from San Jose State University in December 2013. Her interest in the Digital Humanities lies with collaborative authorship, exploring new methods of presenting ideas and materials, and creating open source projects that are available to the broader community. She is currently seeking publication for her first novel and opportunities to collaborate on projects with other writers. Jonathan Cook is currently working on his MFA in creative writing at San Jose State University. His areas of interest include Post-Structuralism, Deconstruction, Hermeneutics, and Existentialism—especially from thinkers like Barthes, Derrida, Camus, and Sartre. This article analyzes the ways that online business writing courses can provide effective opportunities for students to learn to professionalize themselves. Arguing that business writing classes should emphasize critical identity production and reflection, I describe two assignments I give students that ask them to engage the course material as professionals practicing business writing rather than as students learning how to write like professionals. I draw on G. Petriglieri and J. Petriglieri’s (2010) concept of identity workspaces to argue that online writing courses should become these kinds of spaces in order to best prepare students to be professionals in their fields. Business writing textbooks do not often discuss constructing and reflecting on professional identities. Nor, based on the kind of assignments typically given in business writing courses, are these concerns foregrounded in many assignments. Students are told to imagine themselves as HR representatives, CEO’s, business managers, but they are not taught how to enact professional identities in various business scenarios; instead, even in problem-based learning, the main focus—sometimes the only focus—is still on the communication process (if not genres of business communication), and not on reflecting on what it means to be a professional writing for colleagues or clients. Yet this sort of reflection not only helps students become better students and learn the material more deeply, but also helps them transition successfully into their future professions. Making identity construction an explicit part of the curriculum, then, should be an important goal for faculty, as it facilitates our students’ critical understanding of not only what activities they will engage in as professionals, but also how they may make sense of those experiences within the context of their professional development (Ibarra, 2004). Doing so prepares them to take on professional roles by trying out identities in a safe environment in order to learn the principles of and processes for identity construction that they will need on an ongoing basis in their professional careers, especially when they are transitioning into their professional careers (Ibarra & J. Petriglieri 2010; G. Petriglieri & J. Petriglieri 2010; Sutherland & Markauskaite 2012). Online discussion boards in writing classes can help achieve these goals. Although discussion boards are not new technologies in writing classrooms (or in educational spaces in general), in this article I argue that we can put them to a new use, rather than just having them replace in-class discussions. I explore how instructors can deliberately structure online business writing classes not only to facilitate student engagement with the kind of writing they will need to do in order to be successful in business environments, but to practice creating new professional identities and reflect on the ongoing creation of these identities. Drawing on G. Petriglieri & J. Petriglieri’s (2010) concept of identity workspaces, I contend that business writing faculty should make critical identity production and reflection essential components of our course goals, and I show how discussion boards can help us accomplish those goals. Through ongoing public, threaded engagement, discussion boards provide a unique space where students can learn the process of identity construction and receive feedback on their rhetorical moves. Thus, we can use discussion boards in ways that make identity production a central part of our curriculum. In order to build my argument, I analyze two course assignments that I use in my business writing classes to illustrate how online discussion boards can be important and effective identity workspaces. The two assignments I describe help teachers by showing them how to determine what knowledge about professionalization / professional identities students already have and also help teachers create student-centered classes that will help students learn from each other about how to become professionals. Further, the assignments also allow teachers to help students learn the digital literacies that will be important in their construction of professional personas. As we shall see, what is unique about these assignments is, first, my approach to the content in the discussion boards, because I draw on the core components of identity workspaces and, second, the use to which students then put the information. Instead of the discussion boards ending with the online conversation, they lead to the creation of documents that require students to try out the professional identities. These two components make discussion boards less a replacement for class discussion and more a space for the enactment of the complex process of identity construction. It is widely accepted that professional identities are based on “the various meanings attached to oneself by self and others” in professional arenas (Ibarra & J. Petriglieri 2010, 11). These identities are constructed in relationship to the “social roles and group memberships a person holds (social identities) as well as the personal and character traits they display and others attribute to them, based on their conduct (personal identities)” (Ibarra and J. Petriglieri 2010, 11). Identity work is “people’s engagement in forming, repairing, maintaining, and strengthening or revising their identities” (Ibarra & J. Petriglieri 2010, 10). It helps people understand what is expected of them in the professional role, thus a “primary goal of identity work . . . is acting and looking the part, so as to be granted the claimed identity” (Ibarra & Petriglieri 2010 12). While identity work is important at all times because it helps to sustain “one’s sense of personal agency, continuity, and self-esteem” (G. Petriglieri & J. Petriglieri 2010, 45), it is particularly important at times of transition—between school and a job, between one position and the next, or between one company and the next. When individuals are required to perform new identities in order to be successful in their new roles, understanding the principles of and reflecting on the process of identity construction are crucial for an individual’s long-term success (Ibarra & J. Petriglieri 2010; G. Petriglieri & J. Petriglieri 2010; Eliot & Turns 2011). While workplaces do sometimes help employees adopt the necessary identities required to be successful in their particular jobs, they do so only for the specifics of their organization. Further, G. Petriglieri & J. Petriglieri (2010) argue that for business employees, the process of how to successfully do identity work was once taught by corporations, but with the changing business climate, employees are often no longer learning how to successfully adapt their identities in companies (52). Educational institutions also seem to be lacking in providing students with the general principles about how to create professional identities. For example, Eliot & Turns (2011) show that engineering programs do not provide explicit opportunities for helping students connect their learning to their sense of themselves as engineers. Based on their studies of engineering programs, Eliot & Turns (2011) found that those schools focus on professional activities and networking and less on understanding what it means to think and work as an engineer. “Sense-making,” a term they take from Ibarra (2004) which involves connecting assignments and learning to develop their sense of themselves as professionals, rarely happened in any explicit way in the engineering curriculum they studied. In a similar vein, G. Petriglieri and J. Petriglieri (2010) found that business schools rarely teach these transitional skills. These schools tend to focus on teaching what to know (i.e. the knowledge and inquiry that is important to the field), not on how to be a professional, showing a belief that identity work is not seen as an important part of business school curriculum. They contend that if business schools—and we can extend their argument to other types of departments and units—were to make identity work more explicit, students could learn the principles of how to become professionals and professionalize themselves on an ongoing basis throughout their careers, which could help them be more successful in their careers. Creating identity workspaces can help to make identity work more explicit for students and help teach them the necessary principles they will need to be successful in their professions. G. Petriglieri and J. Petriglieri (2010) contend that identity work helps students “present a polished, decisive narrative of where they came from, where they are, and where they want to go” (56). They argue that identity workspaces provide students with a “coherent set of reliable social defenses, sentient communities and vital rites of passages” (44, italics added). Social defenses are a set of collective agreements, familiar habits/practices, and common discourses that provide a sense of security, and like personal defenses, help individuals and organizations adapt to change. Because they make the strange familiar, social defenses alleviate the anxiety associated with new situations and help students “develop through their work” (47). Although social defenses can limit possibilities for the future because they sometimes encourage people to resist change, “they help individuals to organize their experiences coherently in a way that is tolerable and socially legitimized” (G. Petriglieri & J. Petriglieri 2010, 47). The second aspect of identity workspaces, sentient communities, are systems that focus on meeting the emotional needs of members as they make transitions, thus working to create a sense of connectedness and belongingness which is, they claim, important in the process of identity work. Sentient communities can be either macro- or micro-level social networks that last short-term or long-term in which individuals try out being a professional before they are actually a full member of the professional community: “This fantasized belonging reassures such students that they have a future identity, even though they are far from acquiring it fully” (G. Petriglieri & J. Petriglieri 2010, 48). In sentient communities, individuals can receive support from others who are in the same position as they navigate the tricky process of transitioning into new identities. The third aspect of effective identity workspaces is rites of passage. As mythic, universal processes, rites of passages enact the transition from the familiar to the new. Rites of passage are “spaces in which individuals, with the assistance of elders and peers, can shape and discover who they are—or, better yet, who they are becoming” (G. Petriglieri & J. Petriglieri 2010, 48). Instead of just reflecting on or imagining the role of the professional, individuals actually transition into the role of the professional through well-marked, socially accepted tasks/events that serve as evidence of the transition. “Rites of passages are enactments of a social systems’ current mythology (Campbell 1972), ideologies and values (Trice & Beyer 1984). Through them initiates do not just learn the cultural narratives that sustain the social group they are about to enter; they become part of those narratives” (G. Petriglieri & J. Petriglieri 2010, 49). Through rites of passage, individuals develop into professionals and are recognized as such by others through their performances. While there is certainly a consolidation/coherence found at this stage, this is not the end of the process, since there will always be further adaptations that will be made and future transitions that will need to be made. Thus, it is crucial for individuals to continually reflect on the transitions, even after coherence has been found again. When individuals experiences all three of these features—social defenses, sentient communities, and rites of passages in their environments–they can effectively negotiate and reflect on the identity work that helps them actively create and reflect on professional identities rather than just completing assignments (G. Petriglieri & J. Petriglieri 2010). These three aspects teach students the principles of identity work that they can use on an ongoing basis in times of professional transition. Online course environments can be constructed as identity workspaces. As I show in the next section, online discussion boards can provide students with a space to practice the identity work that is an important part of their professionalization. I outline and analyze two assignments I give students in my online business writing classes. These assignments ask them to use online discussion boards to reflect on the process of professionalization, ultimately producing documents that require them to present themselves as professionals and making the process of identity construction a more central part of their learning. This discussion board assignment occurs in the third week of the semester of my upper division business writing courses, which are mostly taken by juniors and seniors from the business college at my university. Students are asked to compare the writing they have done in their other, more traditionally “academic” writing classes (e.g., history or first-year writing courses) to the kinds of writing they have done in business courses or business situations, and the writing they imagine that professionals in their chosen future professions might do. This assignment not only asks them to compare the kinds of writing in terms of generic conventions (e.g., research paper versus business plan), but also asks them to consider the different audiences writers address and the strategies they must use to most effectively reach those audiences. As the discussion progresses, students begin to discuss the identities associated with the various writing tasks, comparing what it means to write as a student and what it means to write as a business professional. At the end of the discussion, students are asked to write a formal email to a novice in their profession about the differences between traditional academic writing and writing done in the career for which they are preparing. In this email, students position themselves as professionals, drawing on what they learned from the discussion board interactions. G. Petriglieri & J. Petriglieri (2010) argue that an important part of social defenses is to help students “organize their experience coherently in a way that is tolerable and socially legitimized” (47). The discussions helped students accomplish this goal. For example, in a discussion about citing sources, Lucy writes, “I don’t think I will need to cite sources in business writing. People will ask for sources if they want them, so what I learned in English 102 isn’t applicable.” Steve countered this by writing that in his workplace “we have to cite where we got our info and document the info with statistics, so Eng 102 did help me.” And Marilyn wrote: “I think it depends on the job you work at.” In this discussion, the students tried to connect what they learned in ENG 102 (the research paper class) to the new material they are faced with in the business writing class and might face in their future careers. Steve drew on his work experiences in order to make sense of the two types of writing, trying to build a sense of coherence, while the two other students drew on their academic writing and speculation about possible workplace needs. The discussion shows that students tried to adapt to the change by organizing their experiences into a coherent framework that made sense to them and their peers. While this type of discussion could be done in a face-to-face classroom, completing it online means that students can engage with more perspectives than they could in a traditional classroom. They can also guide the online discussion more easily than an in-class one, thus making the class more learner-centered, which can encourage students to take more responsibility for their part in the discussion (Hall & Davison 2007). Also, reflection, which can often deepen students’ understanding of the subject matter (Hall & Davison 2007, 167), is facilitated by the discussions being online. Reflection is not just about “mere description of events and experiences” (Ahmad & Lutters 2011, 4); students should be able to synthesize the new experience and knowledge and be able to relate with previous knowledge, forming a current perspective towards an issue or phenomenon” (Ahman & Lutters 2011, 4). Online spaces like discussion boards can encourage this kind of reflection because they are more student-centered and because students can take more time to think about their posts and responses (Rollag 2010, 502). In the other course, what was seriously lacking was a connection with my professor and fellow students. In my personal opinion, I feel the only way you succeed in an English class (and it certainly helps in other fields as well) is feeling comfortable enough to speak freely with your professor (and your peers). There were times when I felt overwhelmed but everyone spoke to me like I was a person, rather than simply text on a computer monitor. That I sincerely appreciate. And that was a key reason why I was successful in this class. Usually I prefer to take English classes in person because of a lack of human communication, but connection through things like the discussion boards helped me. Clearly, Andrea felt that a connection to and a sense of belongingness in the class was an important part of her success in the class. And she was not alone in feeling a greater sense of connection. In their final course reflections, other students in several of my courses reported feeling that they knew their peers in their business writing course better than they knew their peers in their face-to-face classes because they got to engage with each other on an ongoing basis in the discussion boards. The specific topic of the academic versus professional discussion board played a significant role in the students’ feeling of connectedness. Not only did they discuss the kind of writing they did, they shared the way they felt about it, thus creating a space to have their emotional needs met, a central feature of sentient communities. For example, in one of his discussion board posts, Victor wrote, “I get frustrated because I never know how to start when I’m writing a paper, but when we wrote the first report in here, it was easy to start.” One of his peers responded by asking, “Why do you think it was easier? Did you understand the assignment better or was the assignment easier? Or did you like it more?” to which Victor replied, “Not easier . . . I just felt more comfortable writing it and liked it more.” In a similar vein, Jeremy described his frustration with writing reports to his manager: “Oftentimes I don’t feel I can fit what I need to say into the space he wants, but still he wants an extremely small and concise report at the end of the night.” Nancy empathizes with him, asking, “Can’t you ask him if the reports can be longer? It sounds like he’s being unreasonable.” Both Victor and Jeremy shared their feelings about writing situations and interacted with their peers about their emotions, which can help build a sense of connectedness between peers—a connection that can be relied upon later when they work on more complex identity tasks, when feeling part of a community is particularly important in helping each other develop, reflect on, and receive feedback about identities (G. Petriglieri & J. Petriglieri 2010). When writing as a business professional, you will have to write financial statements that a company produces yearly. These statements include footnotes and summaries about the information the company is putting out to stockholders. The footnotes are less than a page long, even though they are talking about millions of dollars and thousands of hours of company time. This is one type of professional writing you will have to learn to be successful in the field. In his description in which he provides insider information, he positions himself as a professional who has full knowledge of the genre conventions and thus clearly shows he has begun to negotiate a transition from student to professional. Again, these discussions could be had in a face-to-face environment, but online discussions provide students with an opportunity to engage with a greater number of peers and have their experiences validated and shared, a move that helps build an important sense of community. Online discussion boards are excellent places to build this sense of community because they can provide a higher level of interactivity and collaboration than face-to-face discussions (Brindley et al. 2009). Slagter van Tryon & Bishop (2009) found that online discussions were important to students because they can experience multiple perspectives of others which helps them develop their own views more thoroughly. This engagement can help students’ success. Gallagher-Lepak et al. (2009) point out that “evidence is accumulating in support of a positive correlation between sense of community and student engagement and persistence, course satisfaction, and perceived learning” (133-134). Further, Zhan et al. (2011) found in their comparison study that students who participated in online discussions performed better in the course overall than students who did not engage in discussion boards in the classes because they had deeper engagement with the material on an ongoing basis. Online communities, therefore, can play an important role in students’ success in courses and can have a significant impact in helping students create professional identities. Both of these assignments—the discussion board and the email to the novice—can help teachers create an online environment that helps students thoughtfully create professional identities. The discussion board provides teachers with a fairly simple technological framework that helps them determine students’ current perceptions of professional identities and knowledge of the process of professionalization. While teachers could get some insights into this information through in-class discussions, the online discussions are unique because the teacher witnesses how the students’ conceptions develop in an in-depth way as they engage with each other, since the discussion happens over time, across more than one class period. A discussion board also readily lends itself to the construction of a student-centered learning framework. If teachers emphasize students’ conversations as the heart of the discussions, then students learn from each other, rather than through the traditional instructor initiated and led discussions that are all too prevalent in face-to-face classes. Discussion boards constructed in this way can lead students to help each other learn and expand their understandings about professionals and professionalization. This set-up lends itself to a more learner-centered classroom environment that encourages students to take more responsibility for their learning and become professionals as they engage with their peers and write to the novices in their fields. For this assignment, students are asked to create a personal brand statement that they then post in the “Background” section of their LinkedIn page. Before and after creating this statement, they interact with their peers in discussion boards in which they reflect on the process of creating a coherent professional identity for themselves. In the first discussion board, they reflect on the purpose of personal brand statements and experiment with possible ways of presenting themselves; in the second discussion board (held after their personal brand statement has been written), they analyze the effects of their rhetorical choices on creating a particular professional image. In both discussion boards, they receive feedback from multiple peers who, through their comments and discussion, help the authors negotiate the transition from student to professional. re-integration into society as a new identity. Asking students to engage with each other in the discussion boards with the ultimate purpose of producing a document for a social network engages them in the rites of passage by moving them away from the known—i.e. the classroom situation and the role of student. Then, the discussion boards and the multiple drafts of the personal brand statements provide them with the opportunity to exist in the liminal space that comprises the second part of the rites of passage, and that requires experimenting with multiple representations of their identities. Doing so online means that they have ready access to experts (teacher) and fellow travelers (peers). After experimenting by writing multiple versions of the branding statement and receiving feedback (along with seeing multiple versions of their peers’ statements), they then consolidate their experiences into a coherent identity and present it in a public online social networking site (LinkedIn), thus re-integrating as a new professional who is not just observing or imagining being a professional but is actually acting and being acknowledged by others as a professional. The personal brand statement, then, as a concise yet comprehensive statement that presents a summary of the person as a professional, helps change the individual’s presentation of self from student to professional. Posting their personal brand statement online helps them move their professional identities into a virtual arena, a rite of passage into the professional Web 2.0 generation (Greenhow et al. 2009). For example, Ted’s original personal branding statement gave specific instances in which he solved complex problems while working with his brother on construction sites. He also told personal stories about school projects he completed and listed academic achievements that involved using the same skills. In his original statement, he even chose to include that he played competitive piano and violin. In his reflections on his personal brand statement, he wrote that he was trying to overcome the fact that he was so young by emphasizing all he had achieved. However, in his final personal brand statement, he realized that he did not have to justify his age. He chose to find the commonality amongst all of those experiences, draw them together and use them to present himself as a professional. His second personal branding statement was as follows: “I am strong at solving complex problems, simplifying situations in order to understand how to successfully move forward in them.” His revised statement, which he posted on his fledging LinkedIn page, condensed those individual experiences into a professional identity that he then used to create a public professional persona for himself. Further, in Laurie’s original personal branding statement, she described specific work situations she found herself in and what she had done in them. However, she did not situate herself as a professional, but as a college student who was working part-time jobs. For instance, describing her experience at one part-time retail job, she wrote, “I completed all the tasks that my supervisor told me to while I worked my shift.” This statement suggests that she did her job, but did not take any initiative and did not necessarily see herself as a professional in that environment. The more she progressed through the business writing course, received feedback from her peers, and wrote documents that encouraged her to position herself as a professional, the more she shifted from seeing herself as just a worker to seeing herself as a professional. In comments about her personal brand statement, several of her peers commented that she was selling herself short by presenting her experiences in a limiting way and suggested that she emphasize how she contributed to the company. Drawing on her peers’ comments, she consolidated her retail experiences and foregrounded what she could bring to a company: “I am a young professional looking to bring new and innovative business products and strategies into being in order to benefit the company and its customers.” Her statement presents her as a professional who has much to contribute rather than just a part-time employee. In the final course reflections, Laurie wrote that “at first, I saw myself as a student, but as the class progressed, I started seeing myself as more of a professional.” This shift becomes evident in the changes in her personal brand statement. Online discussion boards can also be an important part of rites of passage because they are effective places for students to receive feedback from fellow travelers as the unfamiliar is explored (G. Petriglieri & J. Petriglieri 2010). When the student leaves the familiar—student—and ventures into the unknown—professional—and enters into that liminal space, it is important to have ongoing supportive feedback about one’s forays into the unknown. As Labrecque et al. (2011) show, all too often one’s own interpretation of a personal branding statement differs from others’ perceptions of the branding statement, so it is crucial to receive feedback from others before posting their brands online. Online discussions are useful because students receive feedback from multiple fellow travelers who are negotiating the same task and are familiar with the goals and challenges of creating a digital identity. The online spaces help students learn more strategies for building successful identities that will help them in the future when they find themselves in transition (Eliot & Turns 2011). For example, in Michael’s original personal branding statement, his “personal mantra,” as he called it, was the statement “conquer the grind,” which he told his audience was based on a quote from a high school football coach. Comments from his fellow students suggested that recruiters and future employers would not care about his high school experiences and might, in fact, see a reference like this (and especially a quote from a coach) as immature. One peer stated that “an inspirational quote from someone else isn’t what a personal brand statement is about.” After reading the feedback, Michael revised his statement to “I will conquer whatever the day brings to me, no matter what the challenge,” without stating where he derived the idea from. In his reflections in the second discussion board, he stated, “I kept the ‘conquer’ part, but took out the quote to sound more professional since my peers said it didn’t sound right. I really didn’t think about how a quote from my coach would seem unprofessional.” In his description, he transitioned from presenting himself as a student to positioning himself more professionally, based on the comments from his peers. Another example comes from Rose’s personal brand statement. Her first one was short: “I am a creative, reliable worker with a passion to lead.” Her peers commented that the word “passion” did not seem professional and that her description was too short and generic, suggesting that it did not give a good sense of how she stood out from others. One student asked, “what do you mean when you say ‘reliable?’ How are you more reliable than others?” In her revisions, Rose took some of their suggestions, expanding her descriptions and directly addressing their questions about what made her stand out: “I am a strategic, problem-solving person who is dedicated to leading my team to success. I stand out from the rest because I am consistent in my work, and I always strive to be better than the rest. I am a creative, reliable worker with a passion to lead.” However, she still included her original statement. In the second discussion board, she reflected: “I felt my first statement captured who I am and did sound professional. I would stand behind it and send it out. That’s why I didn’t change it.” Both Michael’s and Rose’s examples show that students reflected upon their peers’ comments and used them in their own work to consider how to professionalize themselves. LinkedIn is becoming a highly used social networking tool for job searching and networking, so creating a digital presence there is crucial to a professional identity in the Web 2.0 generation (O’Murchu, et al. 2004; Skeels & Grudin 2009; Thew 2008). Through this assignment, students learn digital literacy skills that they will need to create a successful online persona. An important part of a rite of passage is that newcomers are actually a part of the “cultural narratives” that sustain a community and there are expert witnesses to attest to their transition into the body of these narratives. Posting digital profiles onto LinkedIn and building a network there publicly achieves this goal in an online environment. These two assignments—the discussion boards and the LinkedIn Personal Brand statement—provide teachers with the opportunity to encourage students to carefully and responsibly construct online professional identities. The discussion boards lead to the production of another more public, higher risk document. This process makes the set-up of the discussion boards crucial because it uses discussion boards to help students explore professional identities. Teachers can use these two-part assignments to help students learn the digital literacies they will need as they progress in their careers. Starting with the discussion board is a good jumping off point because the readership is confined to the membership of the class, making it a safer environment where they can try out multiple approaches without fear of negative impacts on their future careers. Then, once students have honed their self-presentation in the space of the class, they can feel comfortable making that presentation of themselves available to a wider public. Structuring the assignments to move from a limited-audience class discussion board to a public-audience social media space, therefore, helps teachers facilitate students’ careful and responsible production of a professional online identity. Discussion boards can be constructed to be identity workspaces that allow students to practice the important processes of identity construction that they will need in order to transition into new roles in their careers. As I have shown here, making identity work an explicit part of our curriculum can be a useful way to help students learn to professionalize themselves. In my business writing courses, my discussion board assignments ask students to enact and reflect on the creation of professional identities in order to learn not only the material that professionals write but also to learn how professionals create themselves as professionals. Doing this identity work online in identity workspaces like the ones G. Petriglieri & J. Petriglieri (2010) describe provides students with many benefits, such as engaging with multiple perspectives, receiving ongoing feedback, and practicing needed digital literacies. They give and receive useful feedback about their experimentations with professionalizing themselves, and they are provided with a public arena in which to post their newly developed professional identities. When we use discussion forums and other online spaces in this way, we teach them skills they will need now as they transition from students to professionals and in the future as they transition to different roles in their careers. Akyol, Z. & Garrison, D. 2011. “Assessing Metacognition in an Online Community.” Internet and Higher Education 14:183-190. OCLC 4796886204. Ahmad, R & Lutters, W. 2011. “Promoting Reflective Learning: The Role of Blogs in the Classroom.” In Online Communities, edited by A.A. Ozok & P. Zaphiris 3011- 3019. Berlin: Springer-Verlag. OCLC 742149535. Andrews, D. 2002. “Audience-Specific Online Community Design.” Communications of the ACM 45, no. 4: 64-68. OCLC 194780096. Brindley, J., Waiti, C., & Blaschke, L. 2009. “Creating Effective Collaborative Learning Groups in an Online Environment.” The International Review of Research in Open and Distance Learning, 10, no. 3. OCLC 449832057. Campbell, Joseph. 1972. “The Importance of Rites.” In Myths to Life By, 44-60. London, UK: Penguin. OCLC 315491. Costa, C. & Torres, R. 2011. “To Be or Not To Be, the Importance of Digital Identity in the Networked Society.” Educacao, Formacao & Tecnologias. Accessed March 12, 2013. http://www.academia.edu/1158653/To_be_or_not_to_be_the_importance_of_Digital_Identity_in_the_networked_society. OCLC 762012626. Eliot, Matt. & Turns, Jennifer. 2011. “Constructing Professional Portfolios: Sense-Making and Professional Identity Development for Engineering Undergraduates.” Journal of Engineering Education 100, no. 4: 630-654. OCLC 5152415038. Festinger, Leon. 1954. “A Theory of Social Comparison Processes.” Human Relations 7: 117-140. OCLC 614551023. Gallagher-Lepak, Ssusan., Reilly, J. & Killion, Cheryl. 2009. “Nursing Student Perceptions of Community in Online Learning.” Contemporary Nurse 32, no. 1-2: 133-146. OCLC 4808928458. Greenhow, C., Robelia, B., & Hughes, J. 2009. “Learning, Teaching, and Scholarship in a Digital Age: Web 2.0 and Classroom Research: What Path Should We Take Now?” Educational Researcher 38, no. 4: 246-259. OCLC 4664480283. Hall, H. & Davison, B. 2007. “Social Software as Support in Hybrid Learning Environments: The Value of the Blog as a Tool for Reflective Learning and Peer Support.” Library and Information Science Research 29: 163-187. OCLC 442290217. Hoadley, C. M. & Kilner, P. G. 2005. “Using Technology to Transform Communities of Practice into Knowledge-Building Communities.” SIGGROUP Bulletin 25, no. 1: 31-40. OCLC 208446609. Ibarra, Herminia. 2004. “Becoming Yourself: Identity, Networks, and the Dynamics of Role Transition.” Paper Presented at the 2003 Academy of Management Annual Meeting, Seattle, WA. Ibarra, Herminia. 1999. “Provisional Selves: Experimenting with Image and Identity in Professional Adaptation.” Administrative Science Quarterly 44, no. 4: 764-791. OCLC 362174038. Ibarra, Herminia & Petriglieri, Jennifer. 2010. “Identity Work and Play.” Journal of Organizational Change Management 23, no. 1: 10-25. OCLC 615222968. Labrecque, Lauren., Markos, Ereni., & Milne, George. 2011. “Online Personal Branding: Processes, Challenges, and Implications.” Journal of Interactive Marketing 25: 37-50. OCLC 4933805920. Ma, W. & Yuen, A. 2011. “Understanding Online Knowledge Sharing: An Interpersonal Relationship Perspective.” Computers & Education 56, no. 1: 210-219. OCLC 670810241. Mabrito, M. 2001. “Facilitating Interactivity in an Online Business Writing Course.” Business Communication Quarterly 64: 81-86. OCLC 425604115. Nystrom, S. 2009. “The Dynamics of Professional Identity Formation: Graduates’ Transitions from Higher Education to Working Life.” Vocations and Learning 2: 1-18. OCLC 424068947. O’Murchu, I., Breslin, J., & Decker, S. 2004. “Online Social and Business Networking Communities.” DERI Technical Report. Accessed March 12, 2013. http://www.deri.ie/fileadmin/documents/DERI-TR-2004-08-11.pdf. Petriglieri, G. & Insead, J. 2010. “Identity Workspaces: The Case of Business Schools.” Academy of Management Learning & Education 9, no.1: 44-60. OCLC 601596349. Rocco, S. 2010. “Making Reflection Public: Using Interactive Online Discussion Board to Enhance Student Learning.” Reflective Learning 11, no.3: 307-317. OCLC 4839562488. Rollag, K. 2010. “Teaching Business Cases Online through Discussion Boards: Strategies and Best Practices.” Journal of Management Education 34, no. 4: 499-526. OCLC 652108100. Skeel, M., & Grudin, J. 2009. “When Social Networks Cross Boundaries: A Case Study of Workplace Use of Facebook and LinkedIn.” Proceedings of the ACM 2009 International Conference on Supporting Group Work. Accessed May 27, 2013. http://research.microsoft.com/en-us/um/people/jgrudin/publications/newwave/socialnetworking2009.pdf. Slagter van Tryonm Patricia. & Bishop, M. J. 2009. “Theoretical Foundations for Enhancing Social Connectedness in Online Learning Environments.” Distance Education, 30, no. 3: 291-315. OCLC 471897357. Sutherland, Louise. & Markauskaite, Lina. 2012. “Examining the Role of Authenticity in Supporting the Development of Professional Identity: An Example from Teacher Education.” Higher Education 64: 747-766. OCLC 815790839. Thew, David. 2008. “LinkedIn—A User’s Perspective: Using New Channels for Effective Business Networking.” Business Information Review 25, no. 2: 87-90. OCLC 438077850. Trice, Harrison. M., & Beyer, Janice. M. 1984. “Studying Organizational Cultures through Rites and Ceremonials.” Academy of Management Review 9: 653-669. OCLC 4894269790. Zhan, Z., Xu, F., & Ye, H. 2011. “Effects of an Online Learning Community on Active and Reflective Learners’ Learning Performance and Attitudes in a Face-to-Face Undergraduate Course.” Computers & Education 56: 961-968. OCLC 698265544. Patricia Boyd is an Associate Professor at Arizona State University. Her recent work includes research on blogging in the writing classroom, encouraging students to create themselves as “writers,” and analyzing the role that celebrity endorsements shape the identity of the celebrity, not just the consumer.